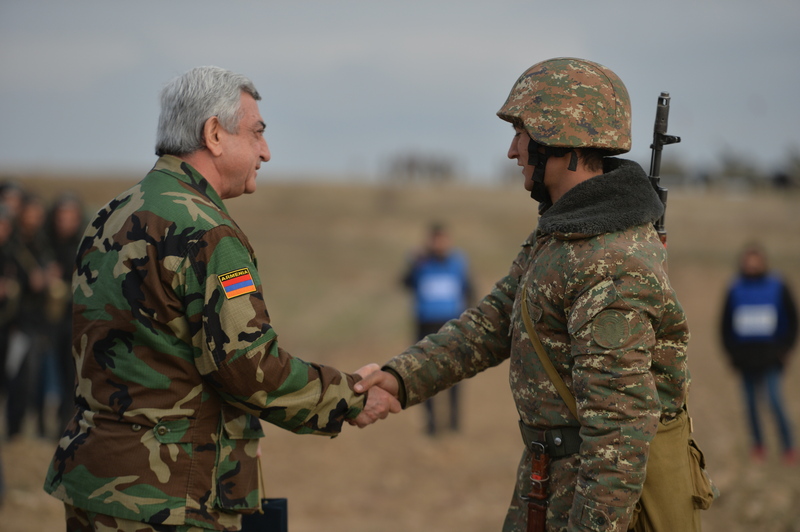 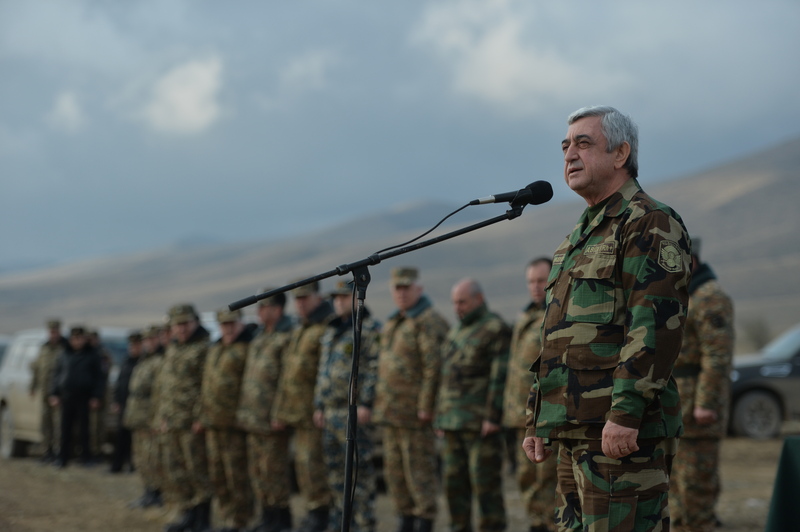 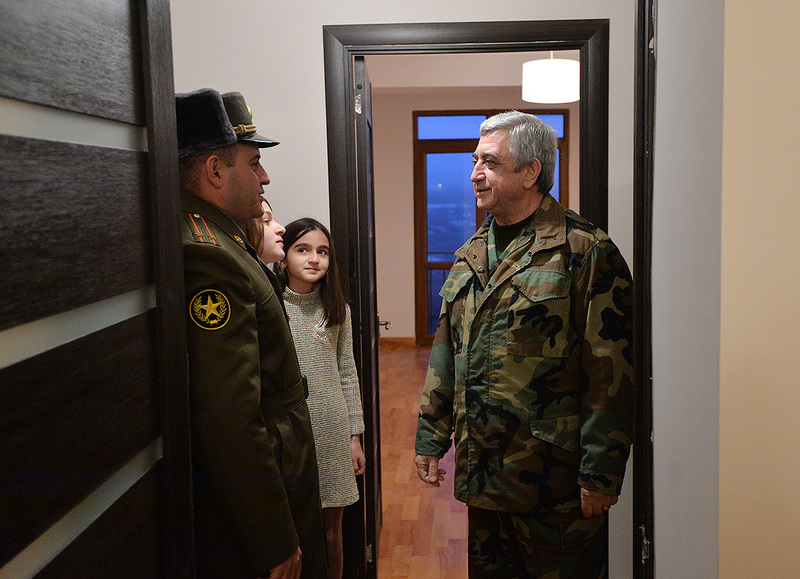 President of the Republic of Armenia, Supreme Commander-in-Chief of the Armed Forces Serzh Sargsyan arrived in the Artsakh Republic (AR) on a working visit within the framework of cooperation between the two Armenian States. 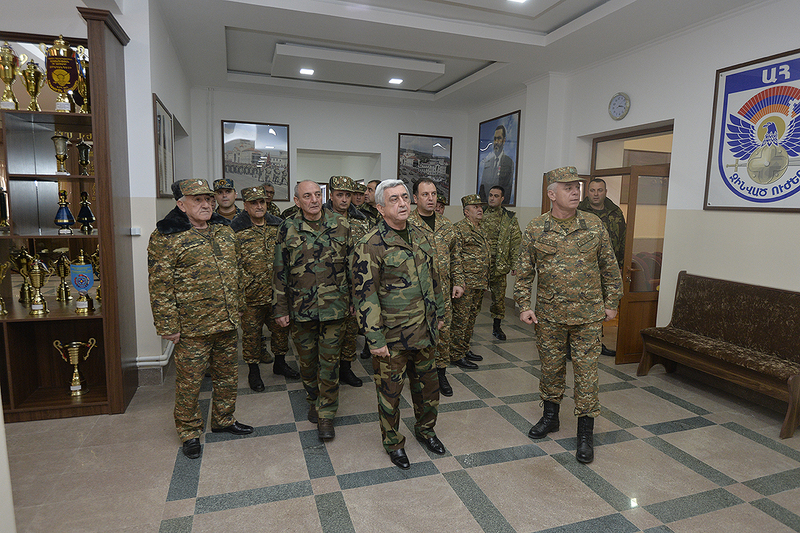 RA President Serzh Sargsyan and AR President Bako Sahakyan called at the Defense Army Headquarters to attend the traditional yearend consultation with the participation of RA and AR Defense Ministers and high-ranking military officials. 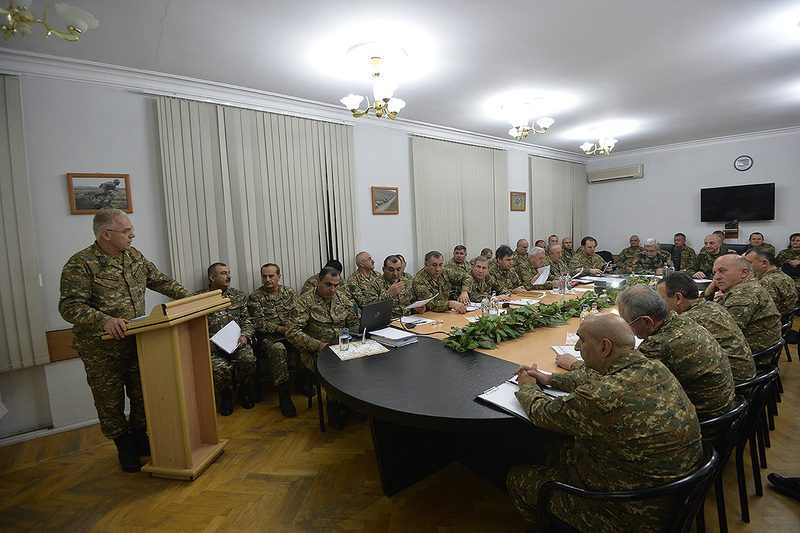 The meeting participants discussed army building-related issues and took note of the report delivered by the Defense Army Commander. 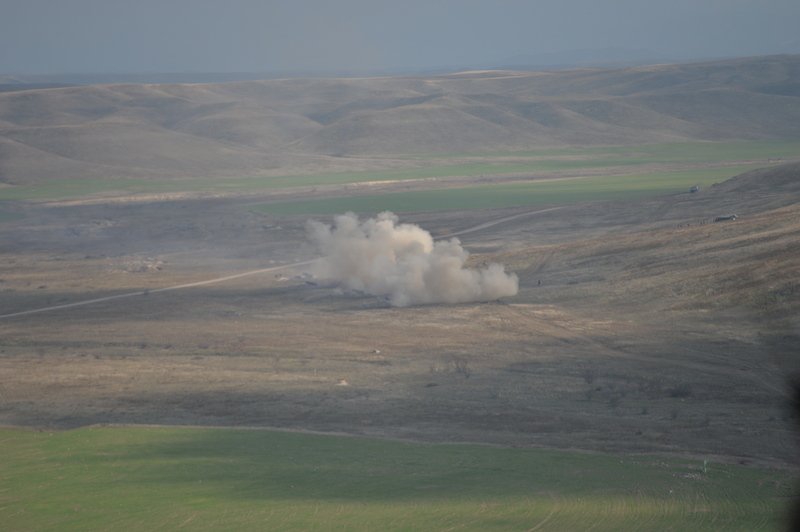 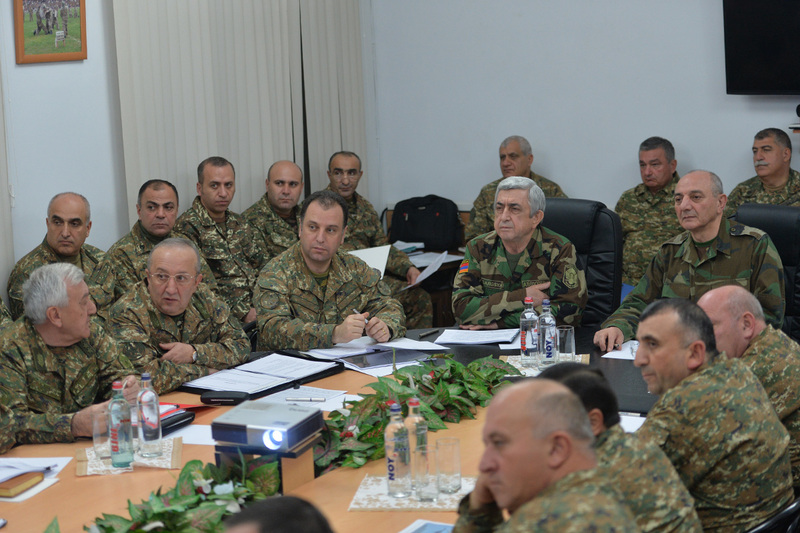 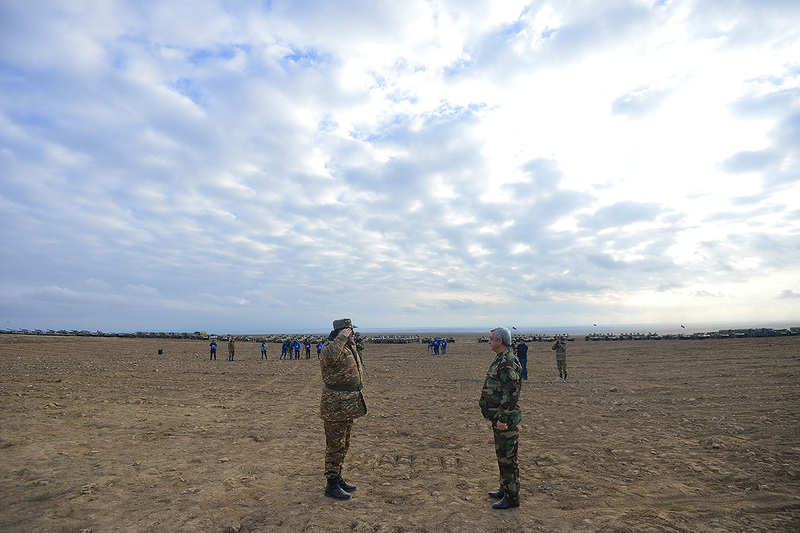 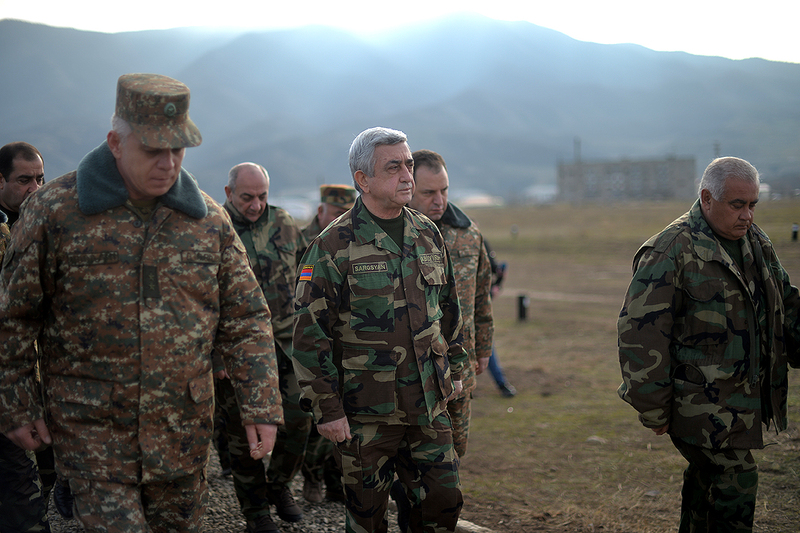 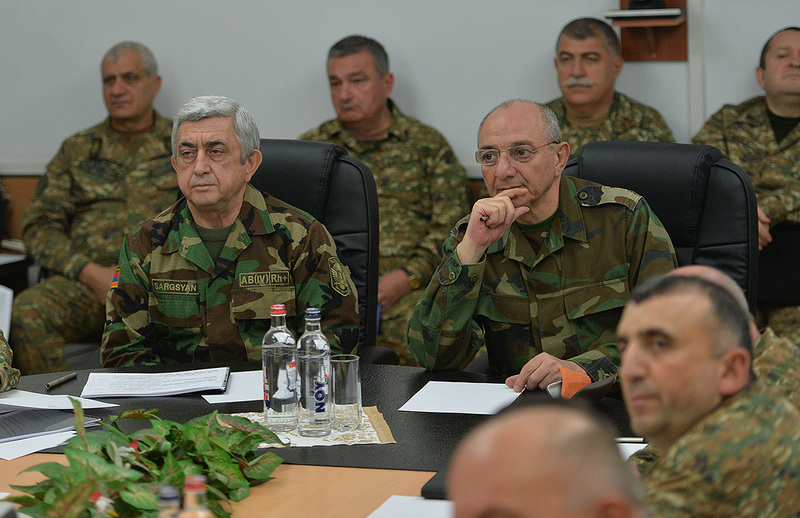 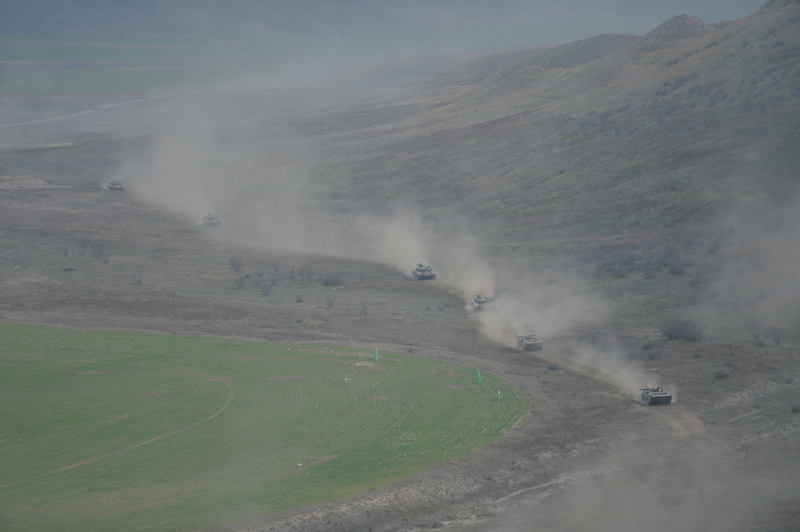 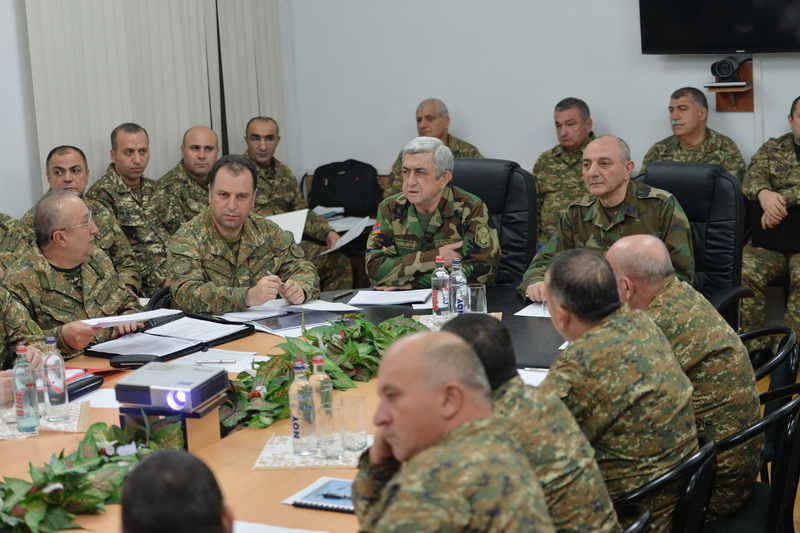 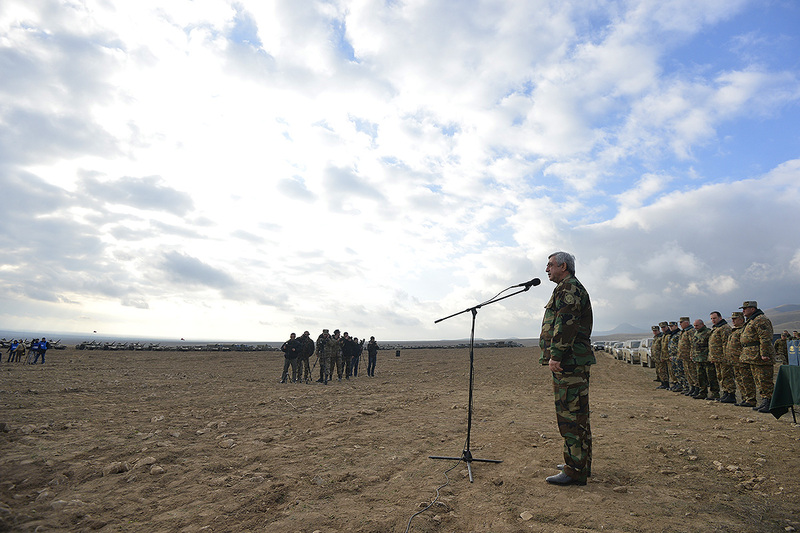 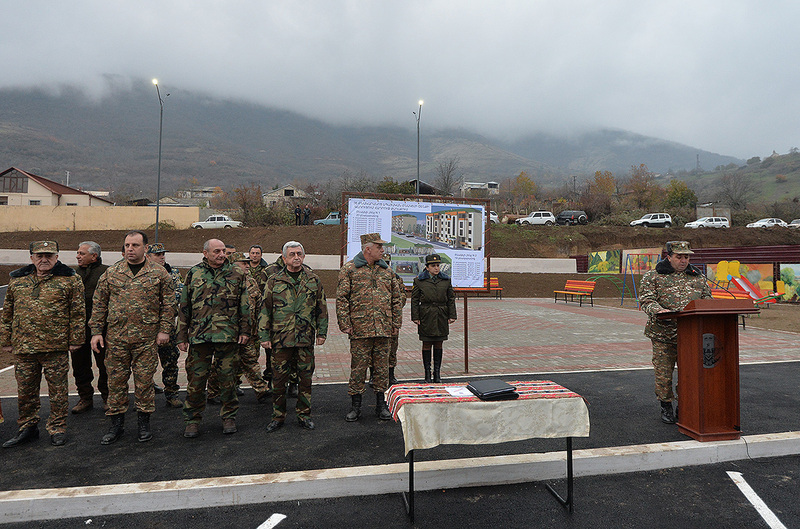 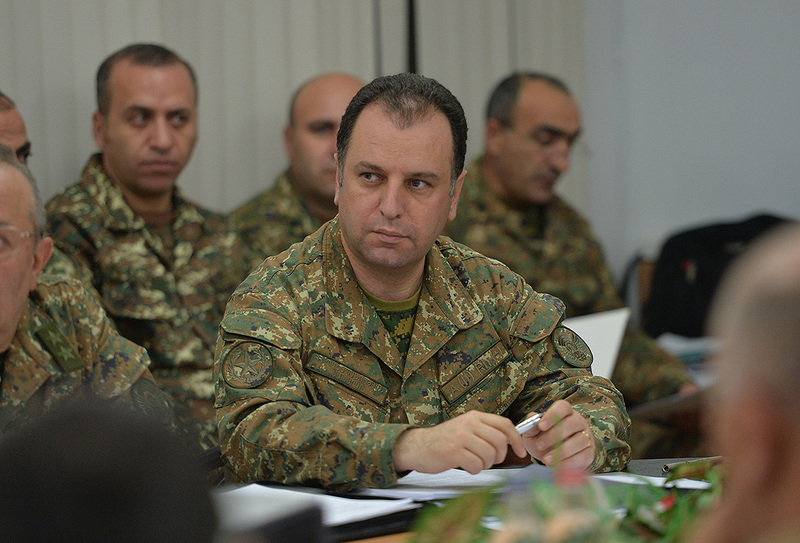 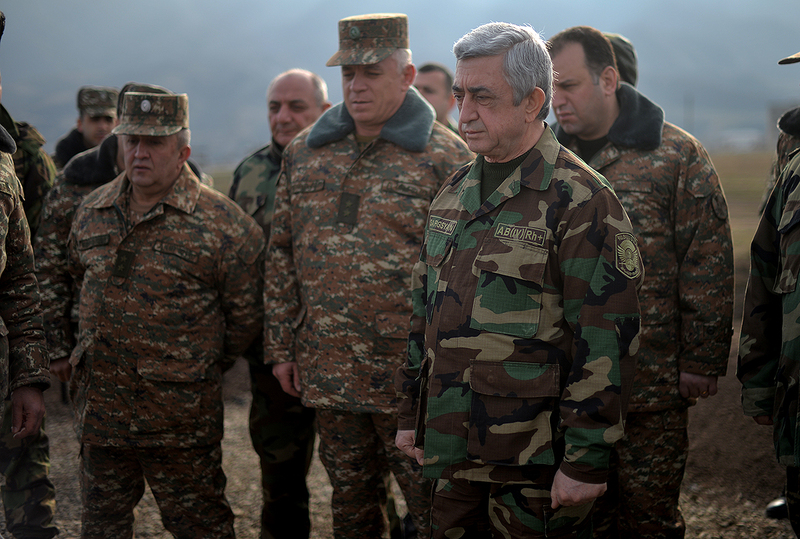 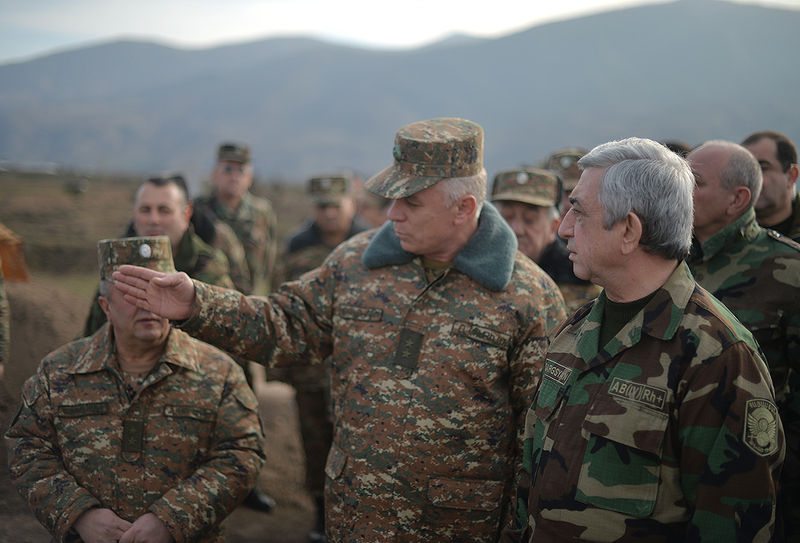 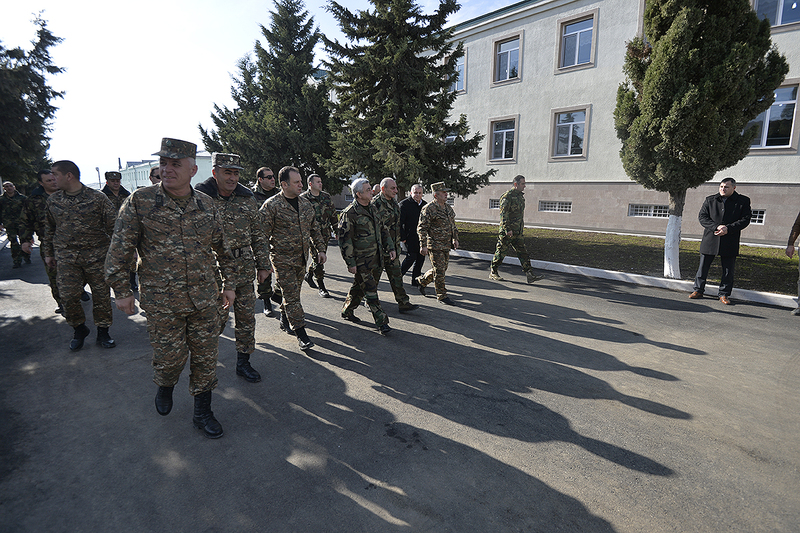 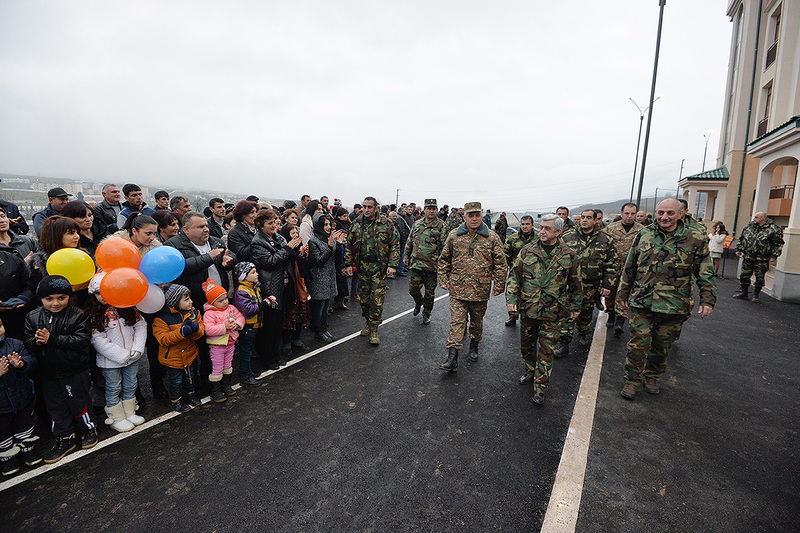 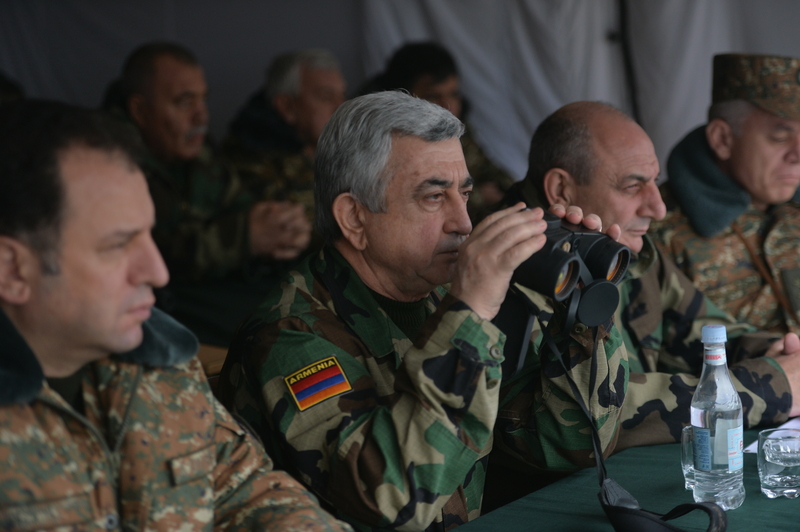 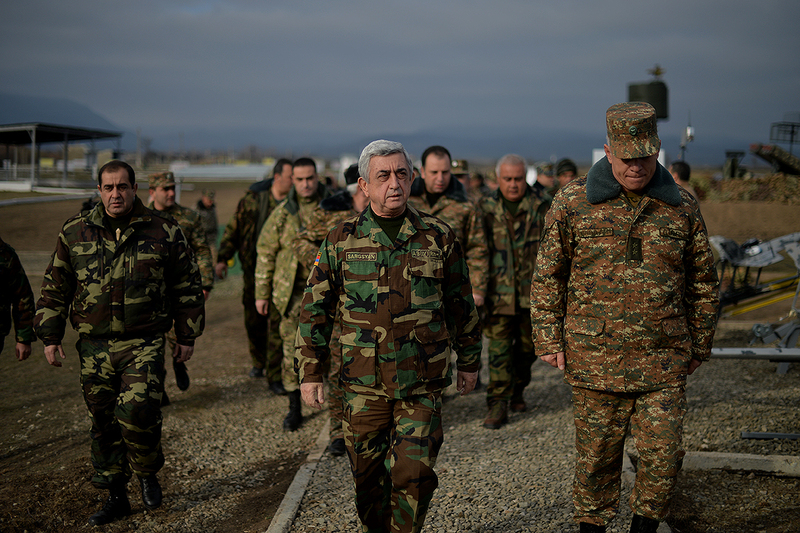 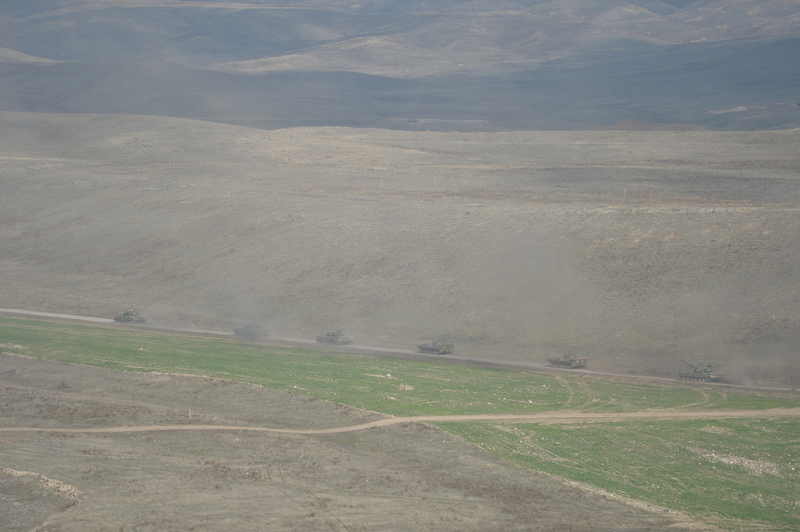 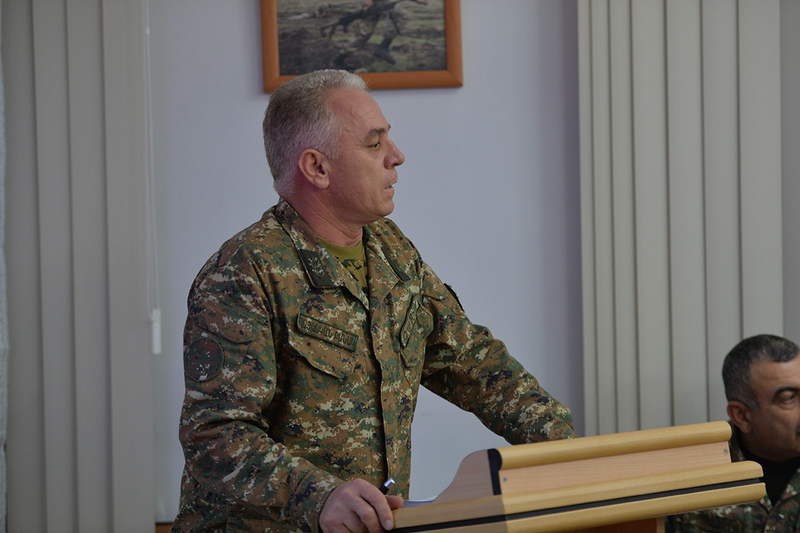 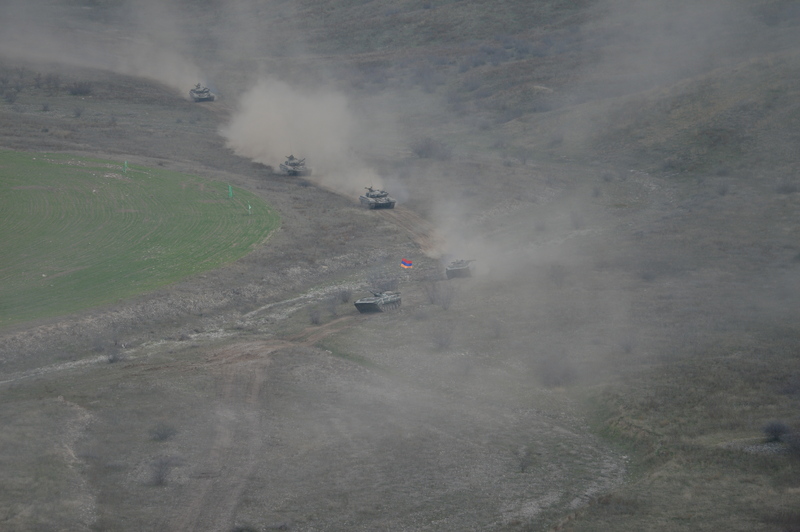 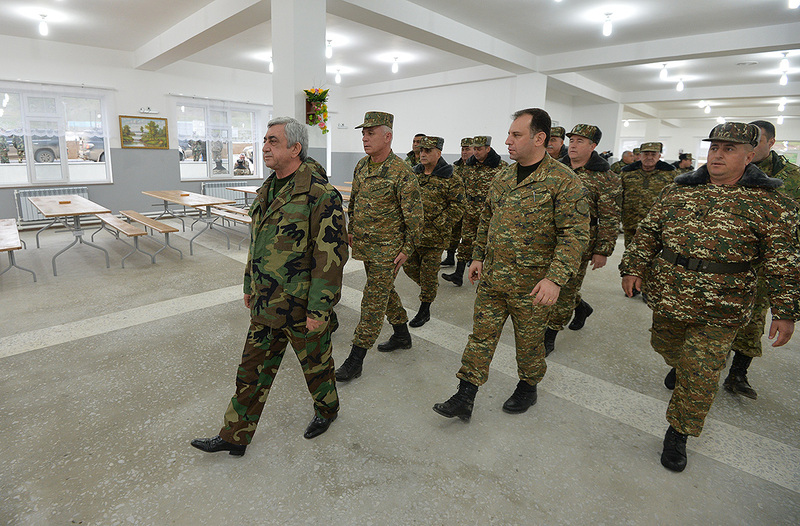 On December 2, the second day of RA President’s working visit to the Republic of Artsakh, within the framework of the ongoing cooperation between the armed forces of the two Armenian republics, RA President Serzh Sargsyan and AR President Bako Sahakyan joined the RA and AR Defense Ministers and high-ranking army officials to inspect the military exercises conducted by the Defense Army’s unified command in the southeastern section of the Republic of Artsakh. 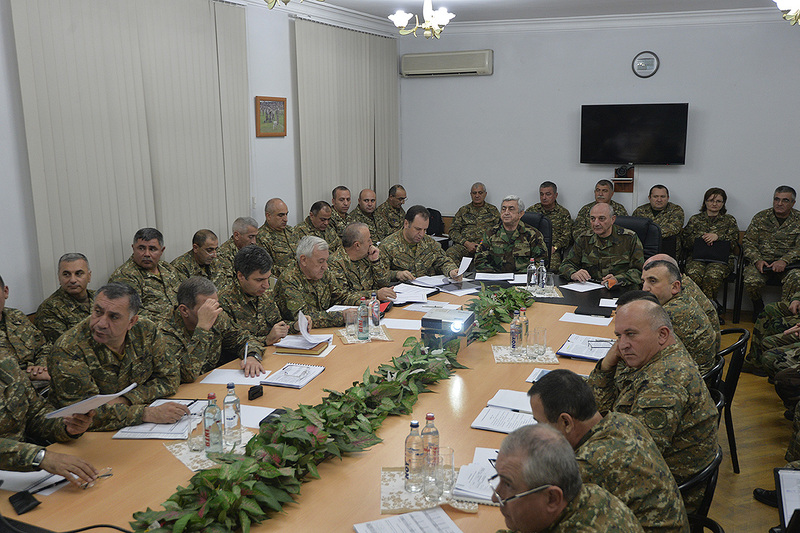 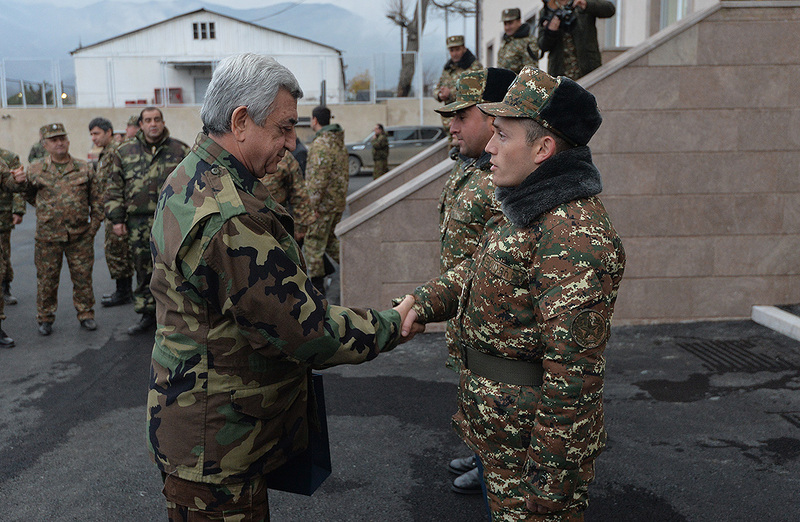 President Sargsyan encouraged the most prominent servicemen with various incentives. 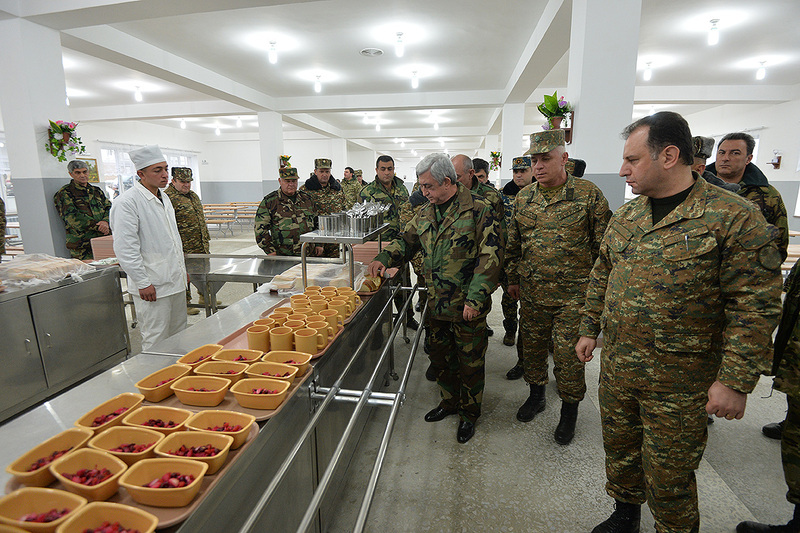 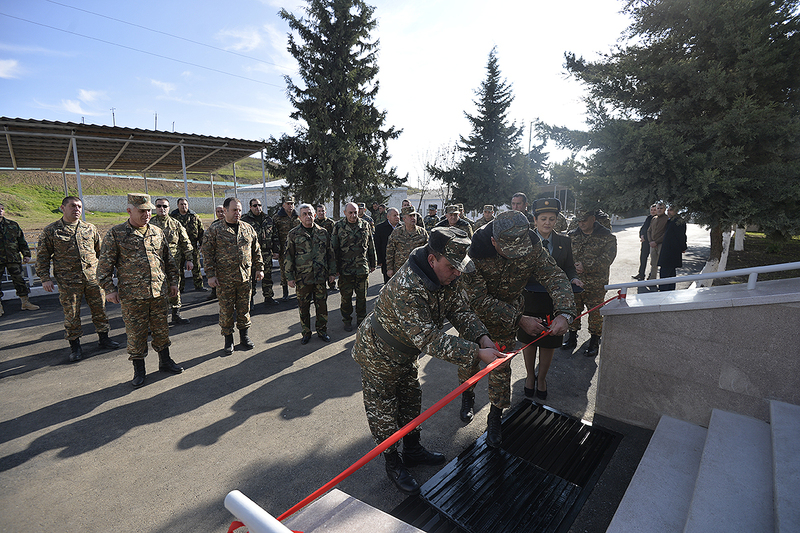 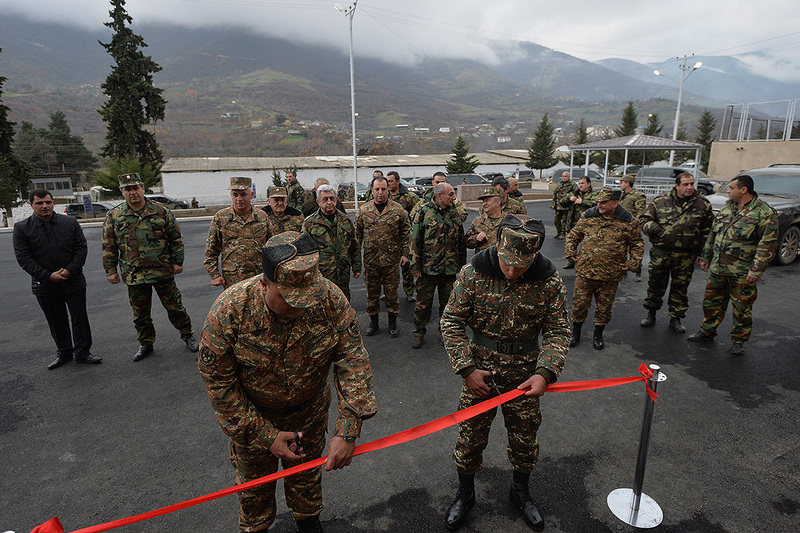 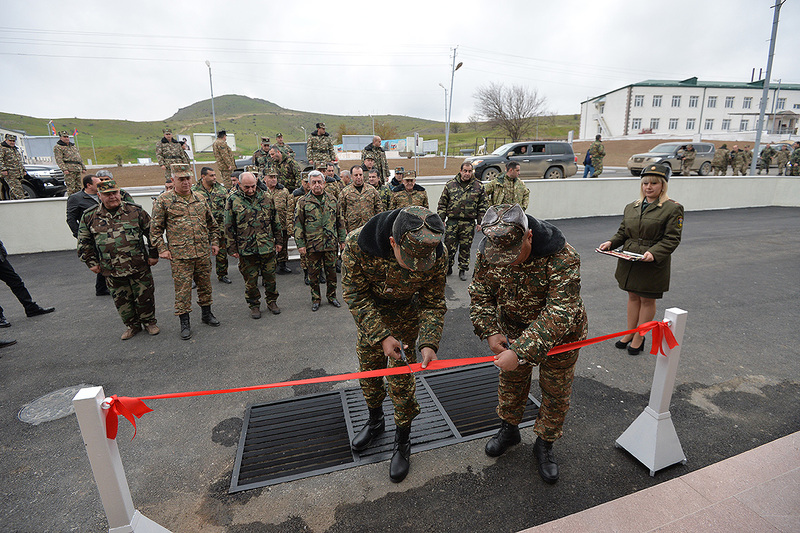 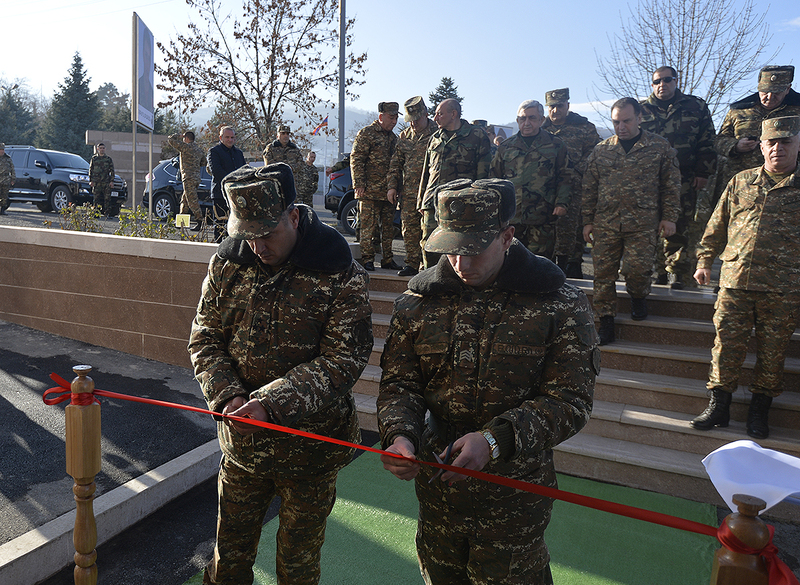 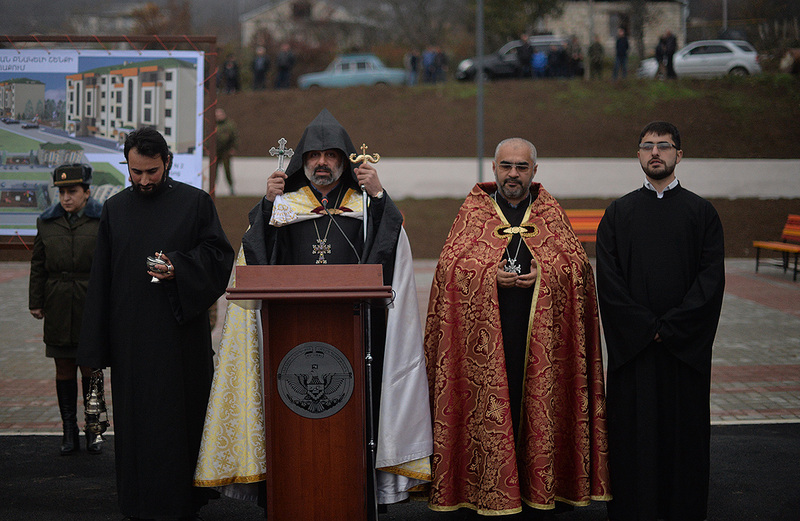 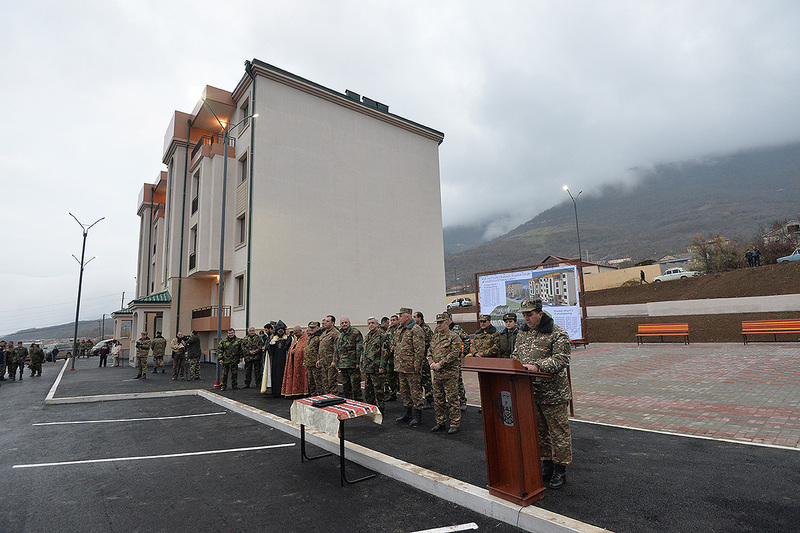 On the same day, the President of the Republic of Armenia attended the commissioning of a multi-apartment residential building for servicemen, as well as the openings of a newly built canteen and barracks at one of the military units. 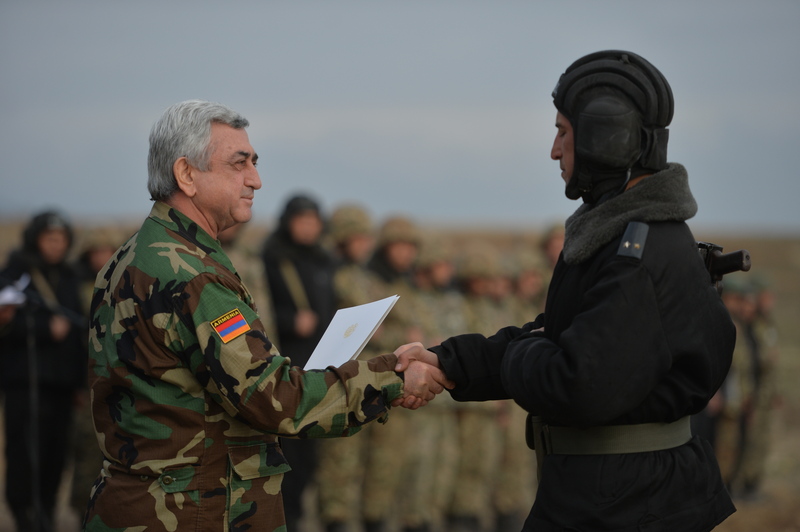 Serzh Sargsyan handed awards and incentives to the best officers, contract and conscript soldiers for dedicated and excellent service. 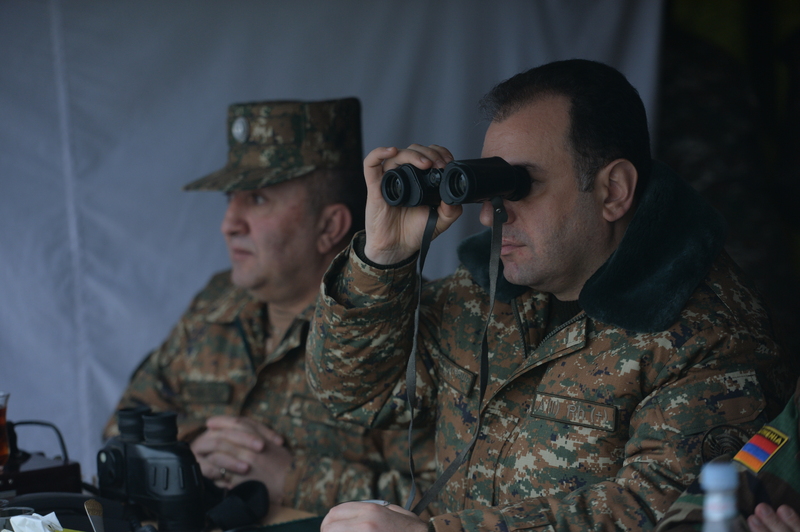 “Strong defense calls for effort, due diligence and hard work, which can ultimately lead to high professionalism. 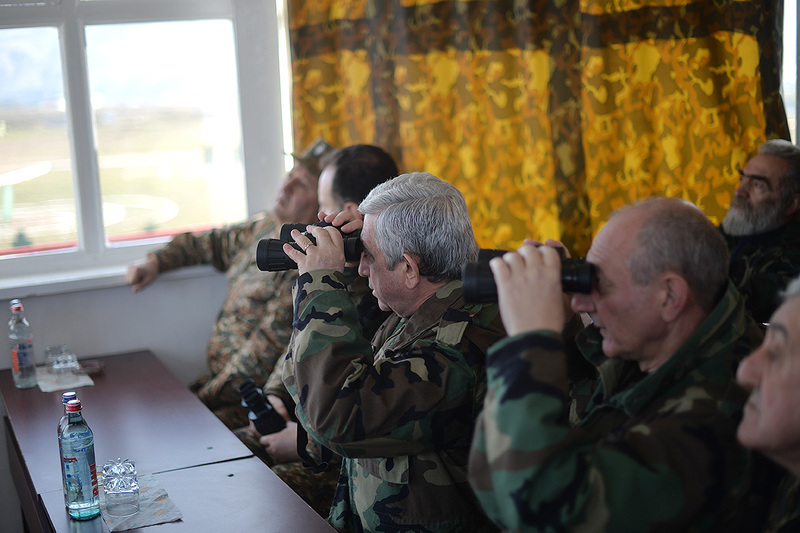 Modern armed forces imply not only state-of-the-art armament, but also the ability to apply it at the right moment and to its full capacity. 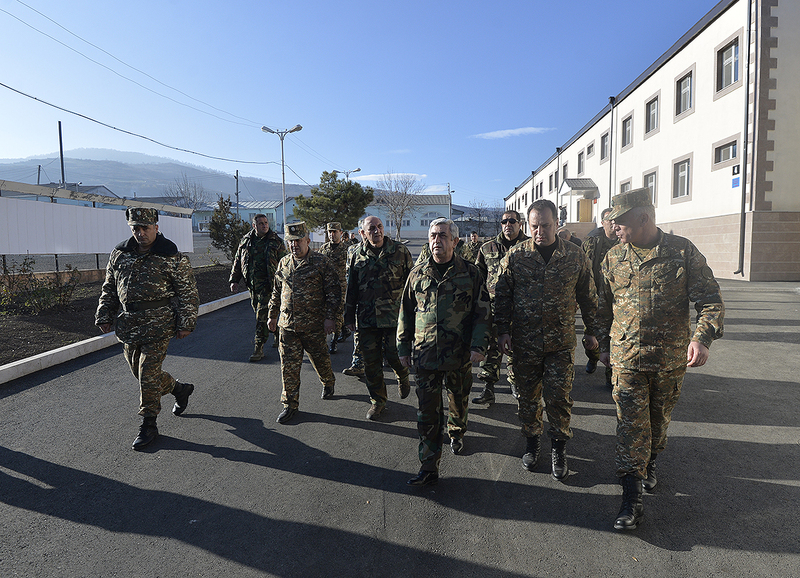 I am grateful to you for today’s drills which testified to your high efficiency. 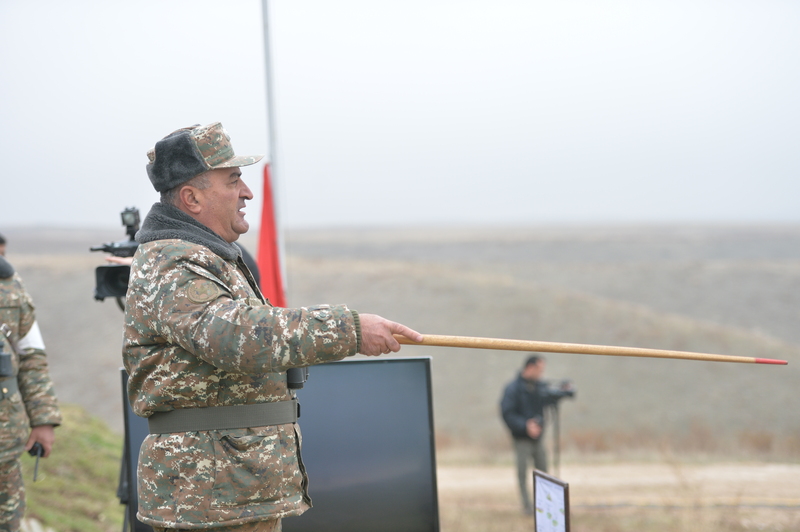 Believe me, this is your response to all those who want to take away our homeland, who are trying to put on show their might and get something out of us. 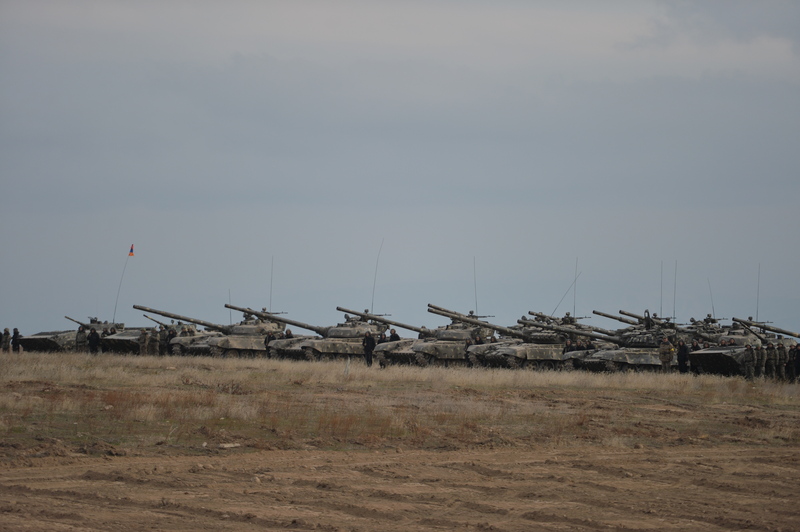 This is also a response to those who are not beside you, who are not in your lines. 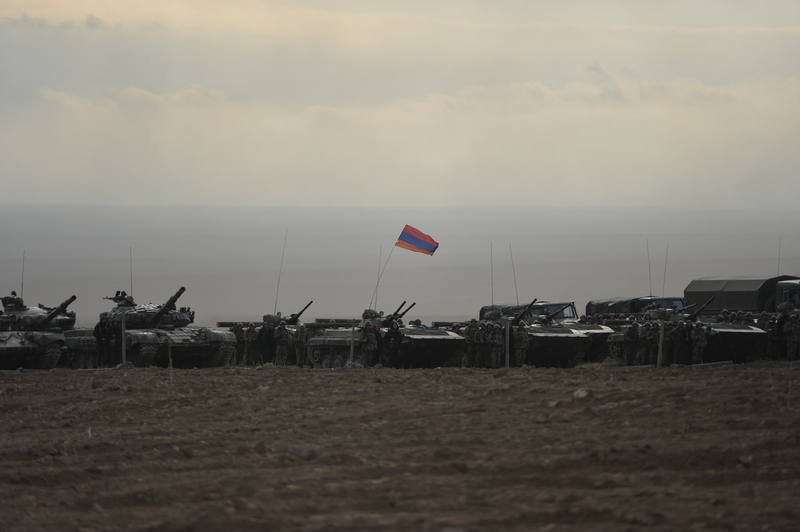 Peoples can protect their homeland if your type is dominant in them. 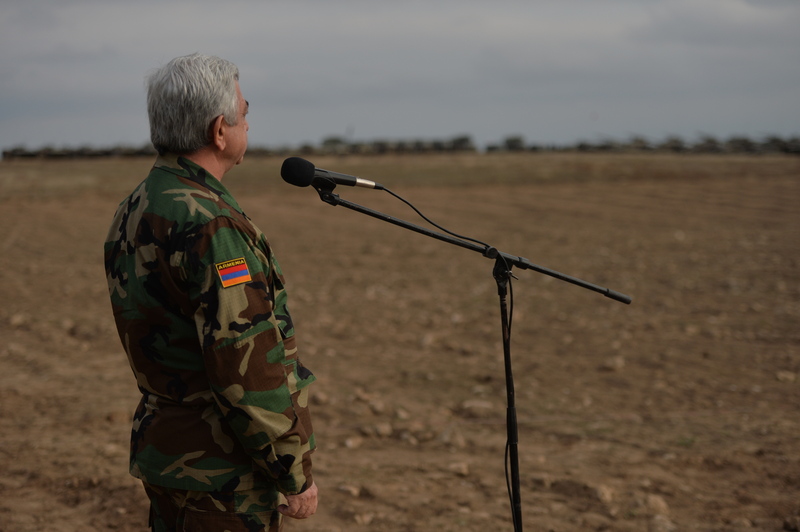 We are in a position to defend our borders, and we will defend our homeland. 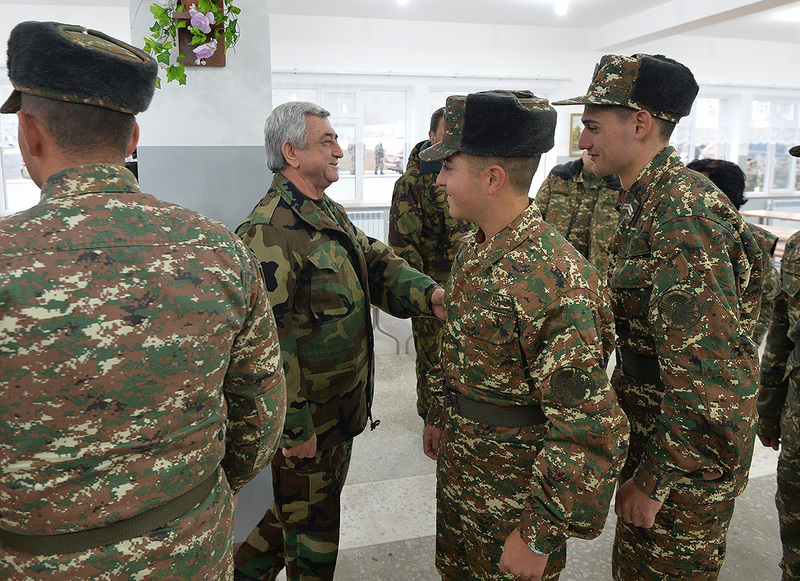 I would like to thank your parents, your teachers, all those who have contributed to your upbringing,” President Sargsyan said, wishing the servicemen a dignified stance and successful service. 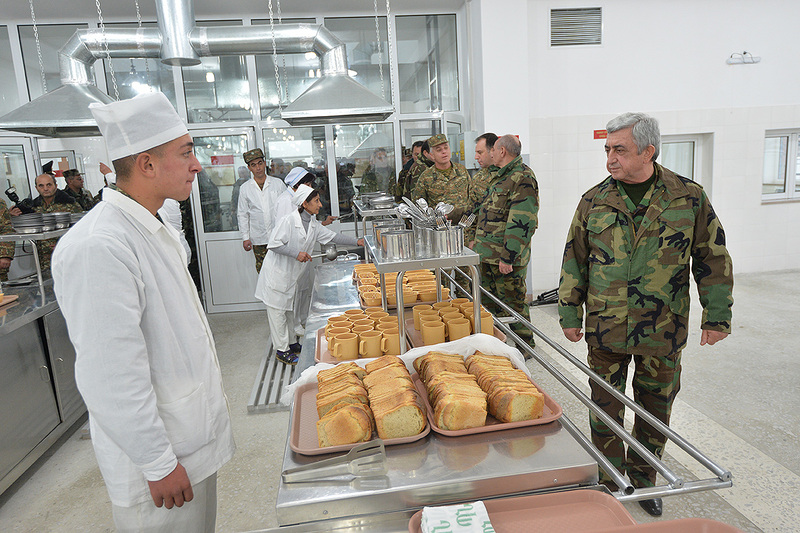 RA President Serzh Sargsyan, who has been paying a working visit to the Republic of Artsakh since this December 1, today joined Artsakh President Bako Sahakyan for a visit to Asbarez educational center, where they were briefed on the military-technical specifications and the purpose of new Armenia-make military equipment, after which the Presidents watched the process of its practical application. 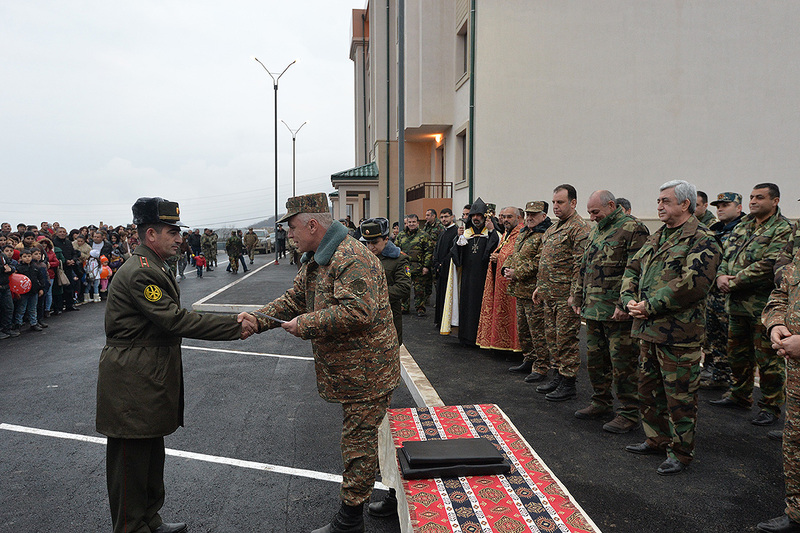 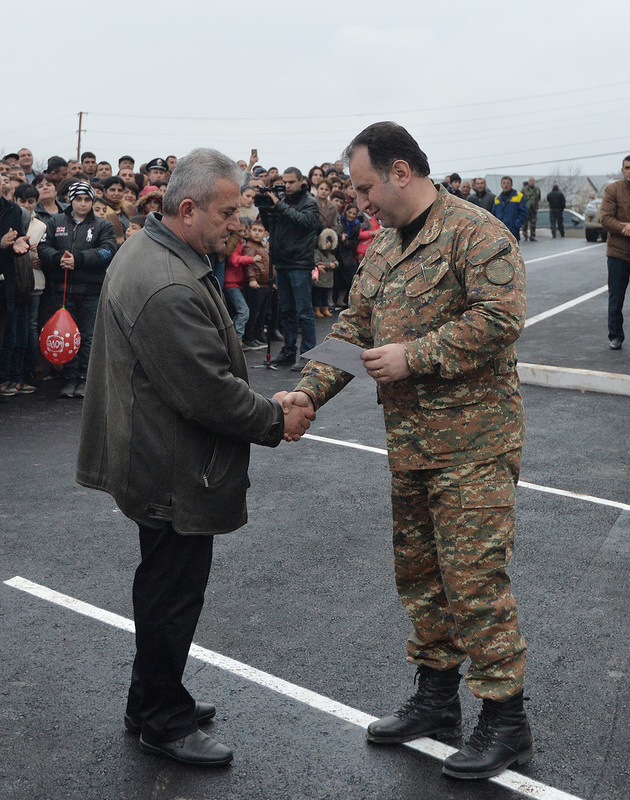 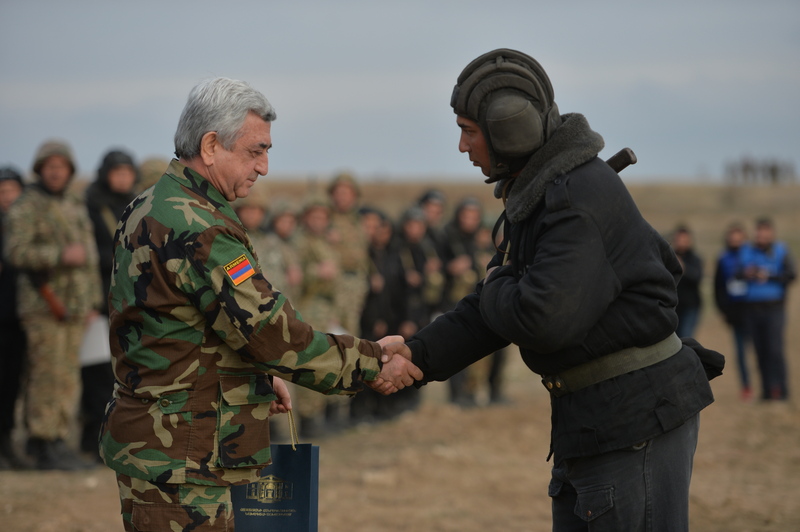 The President of the Republic of Armenia handed in incentives to a number of distinguished servicemen, after which he attended opening ceremonies for a military club and new army barracks in the eastern and central parts of Artsakh. 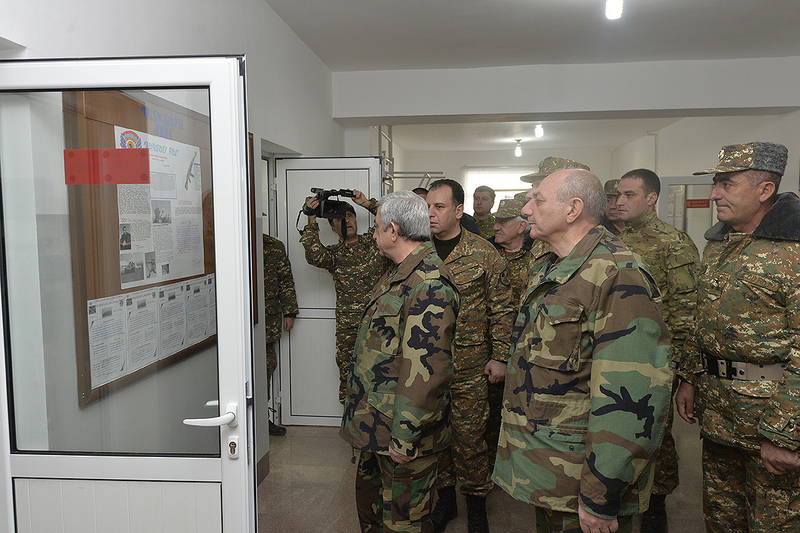 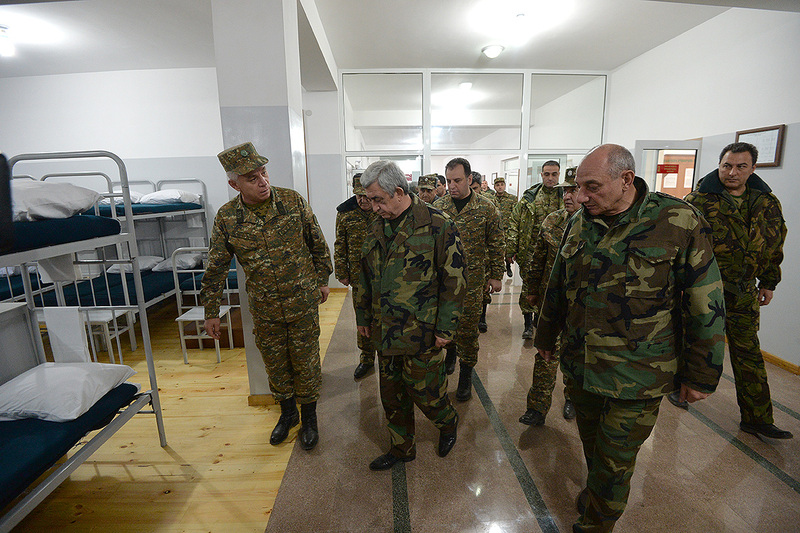 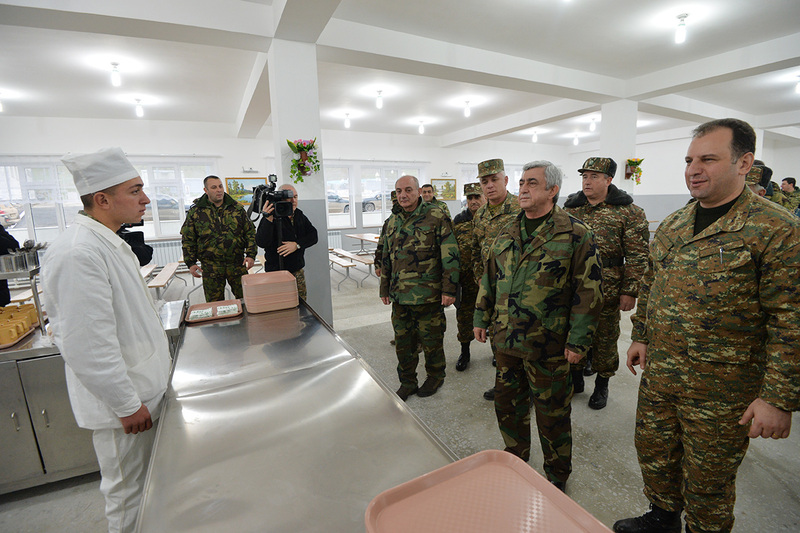 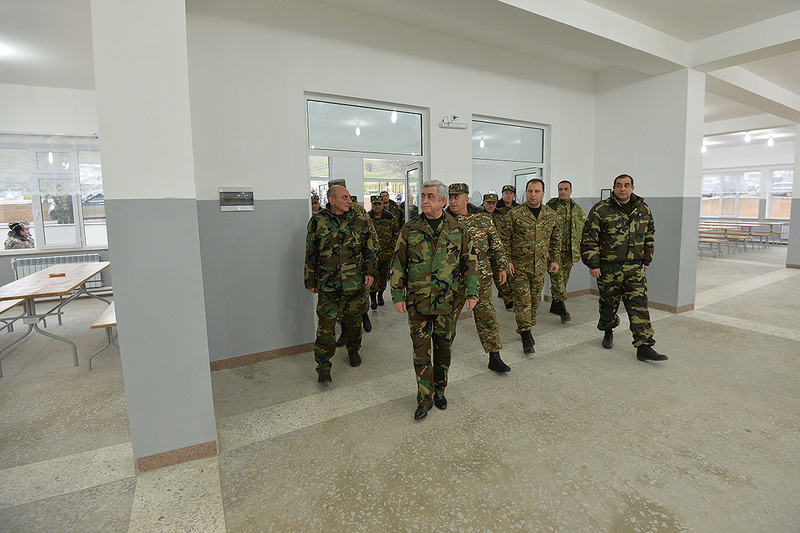 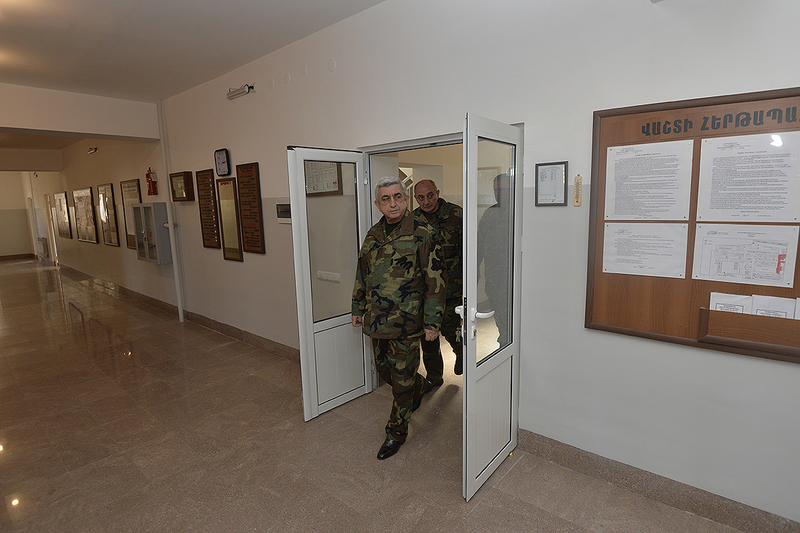 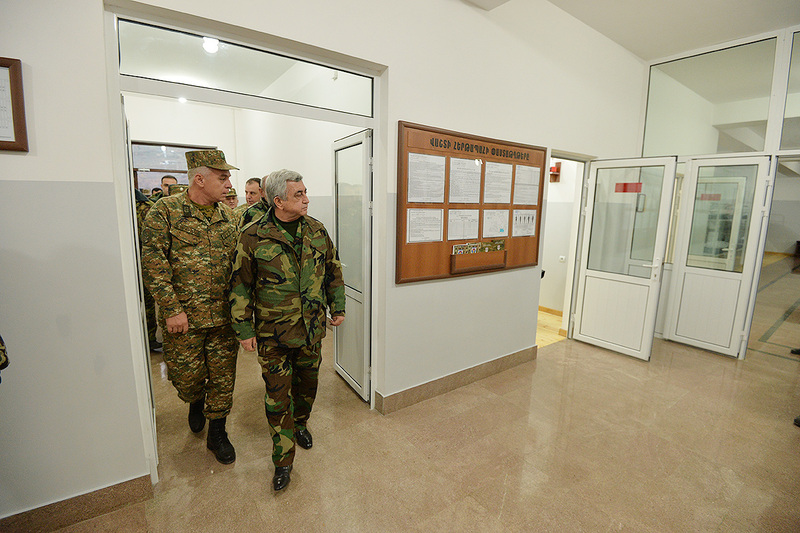 Presidents Serzh Sargsyan and Bako Sahakyan toured the new-built barracks to get acquainted with servicemen’s living conditions. 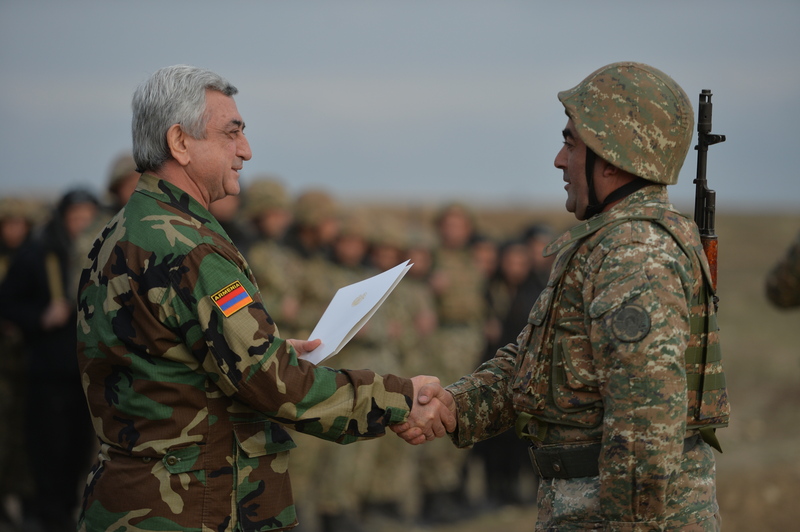 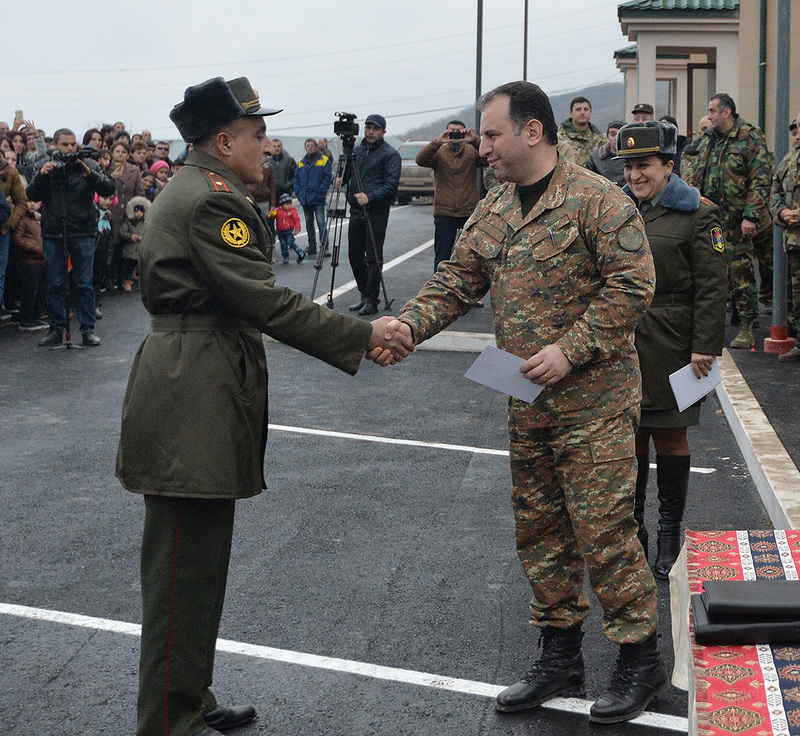 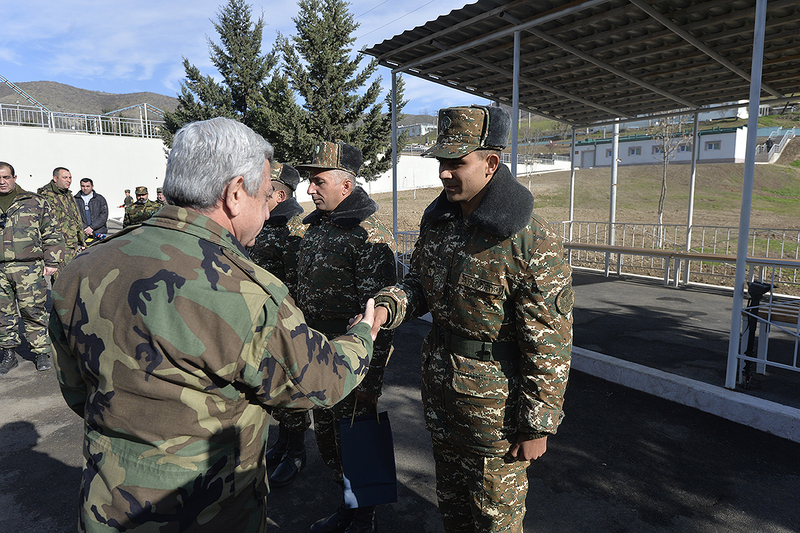 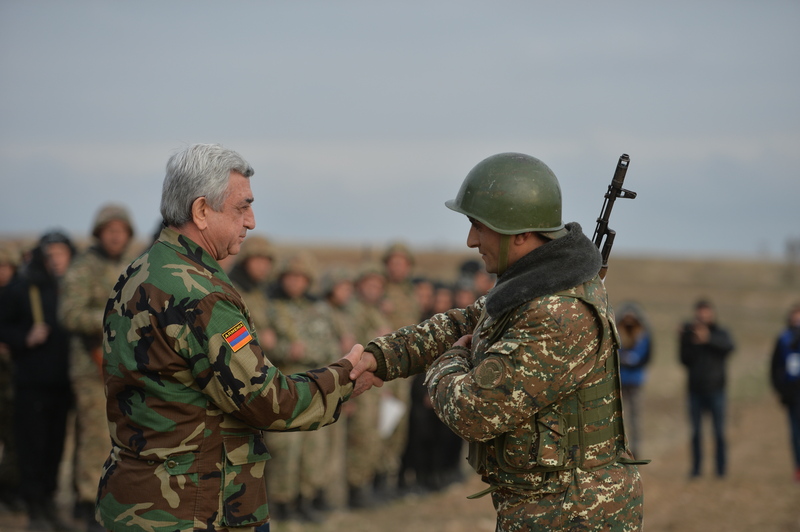 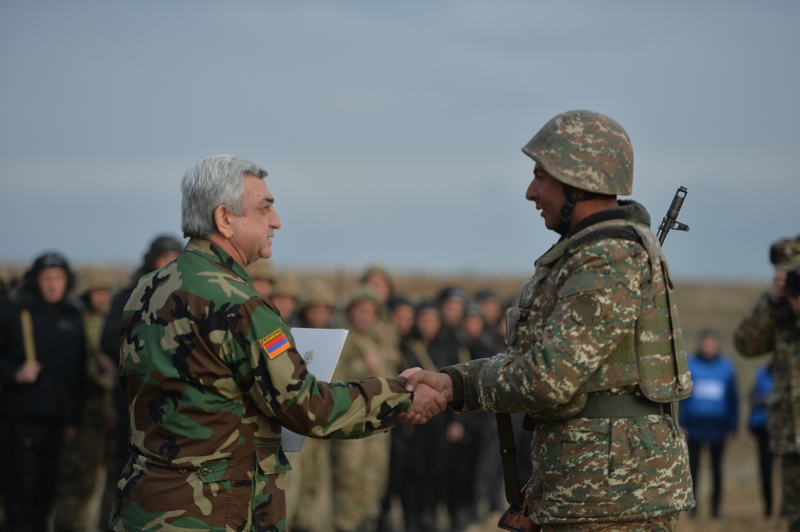 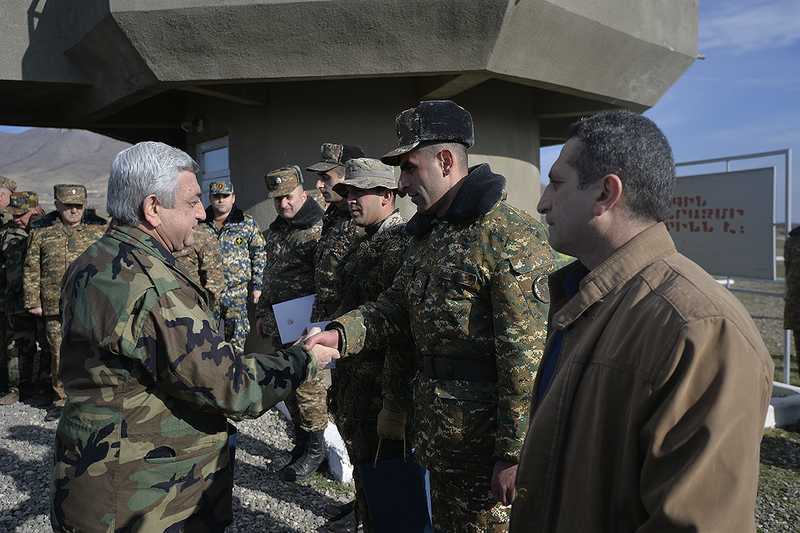 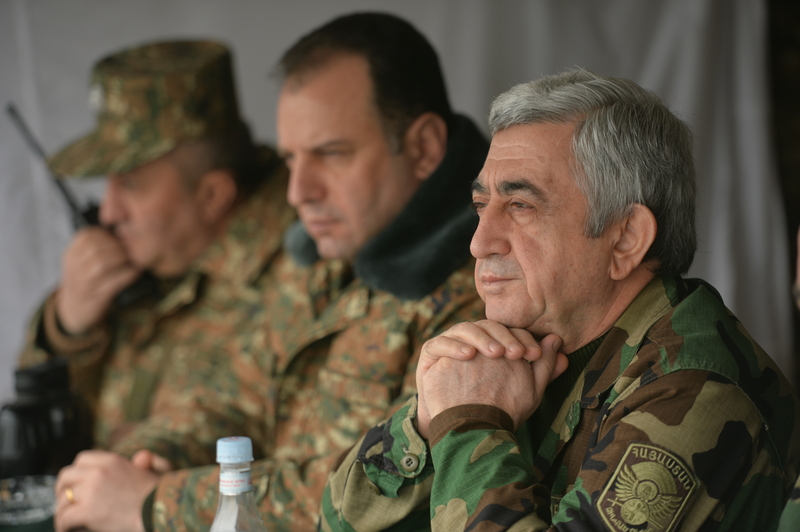 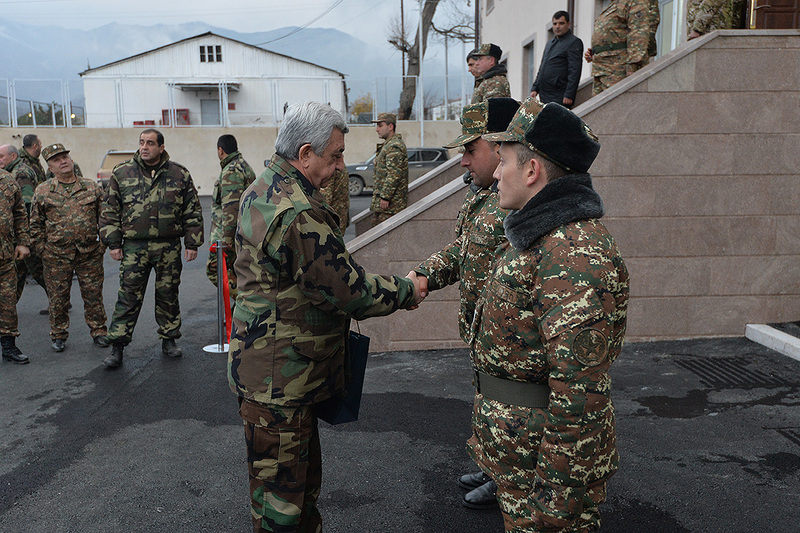 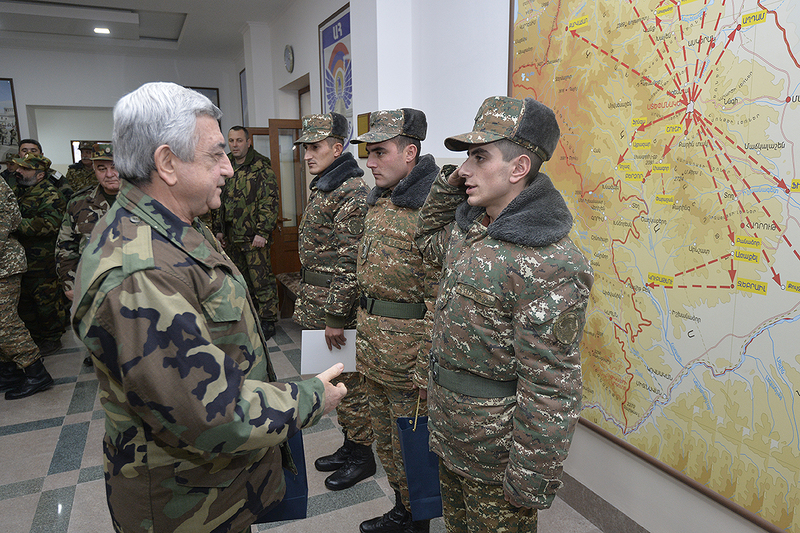 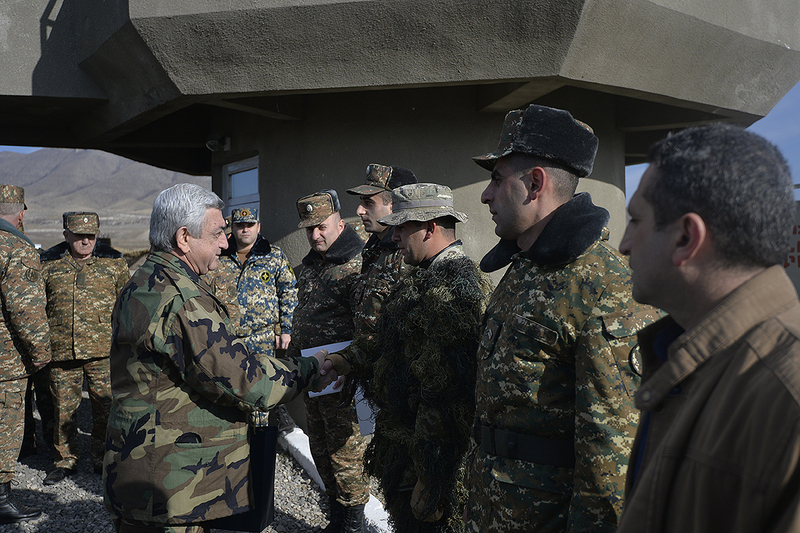 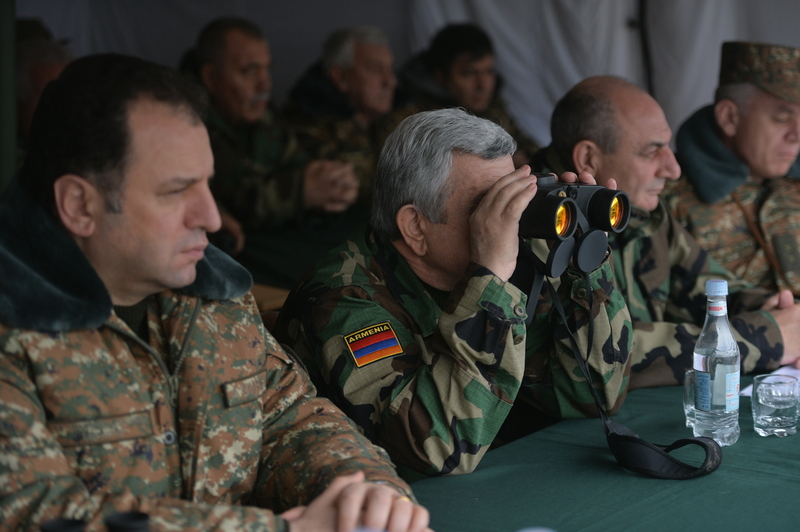 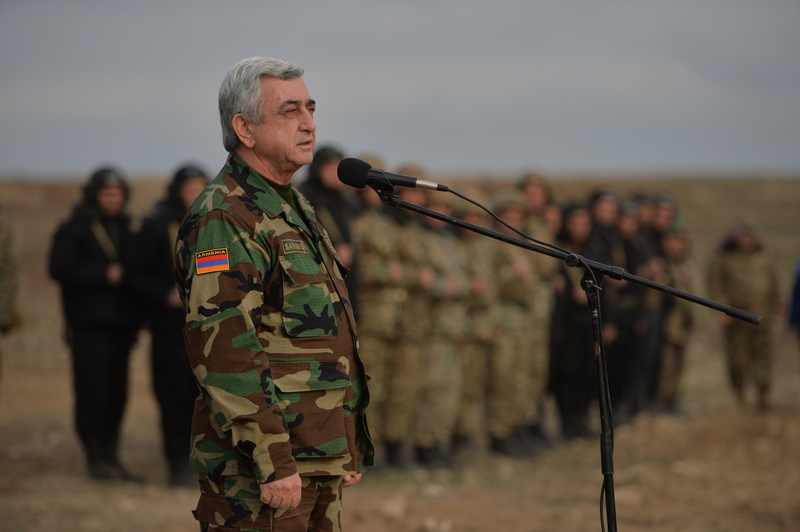 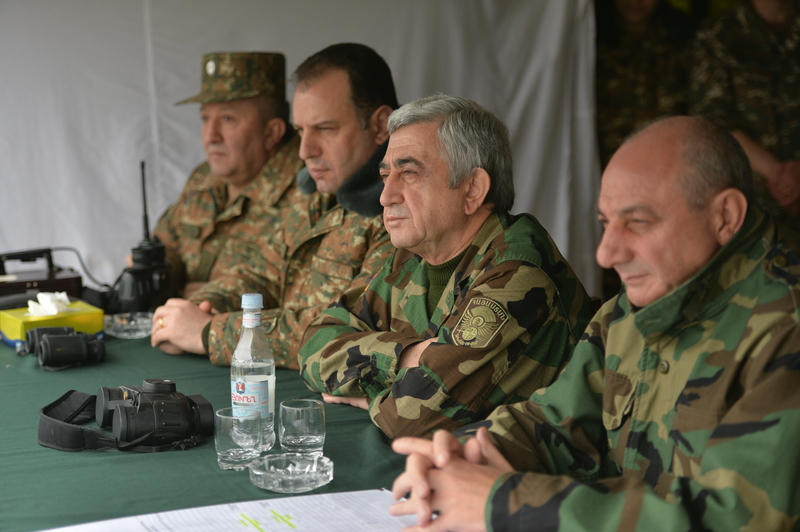 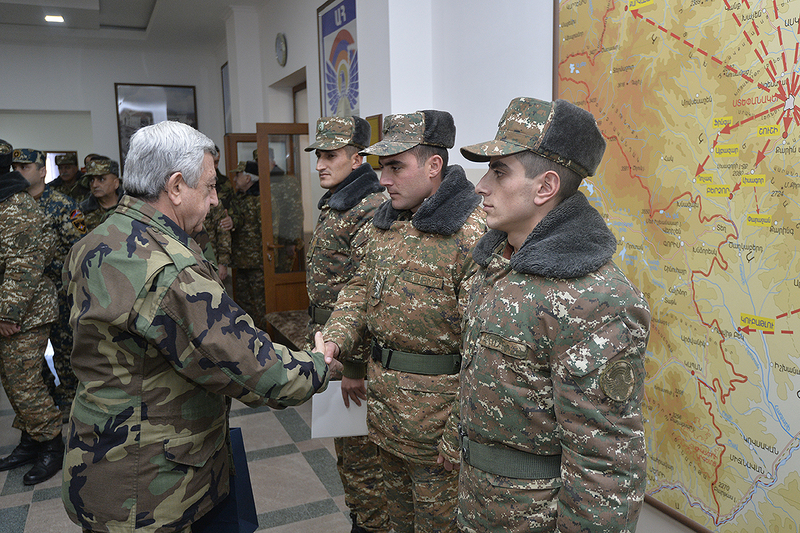 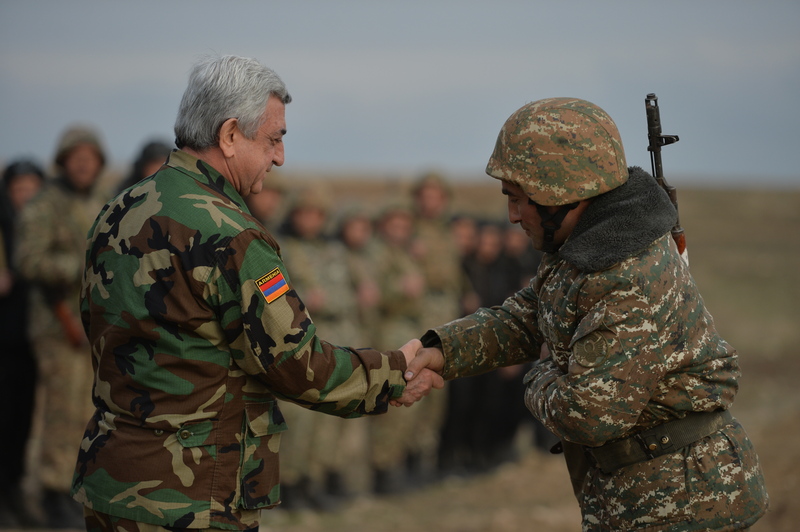 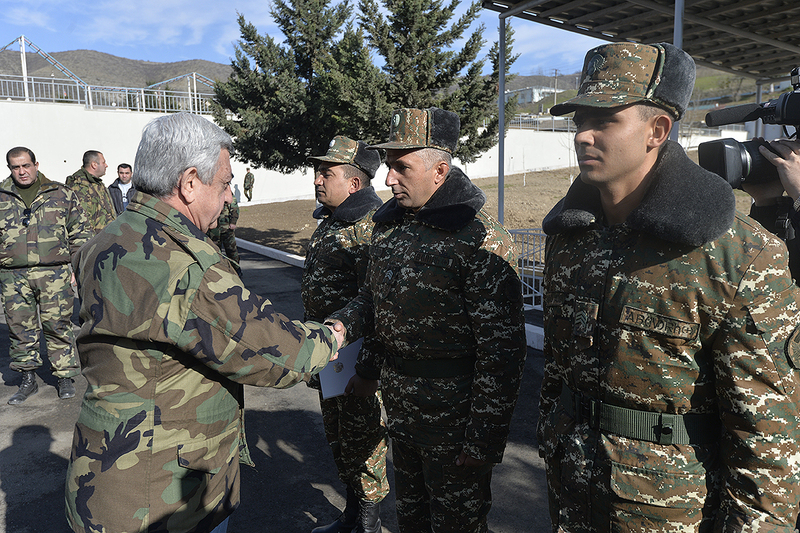 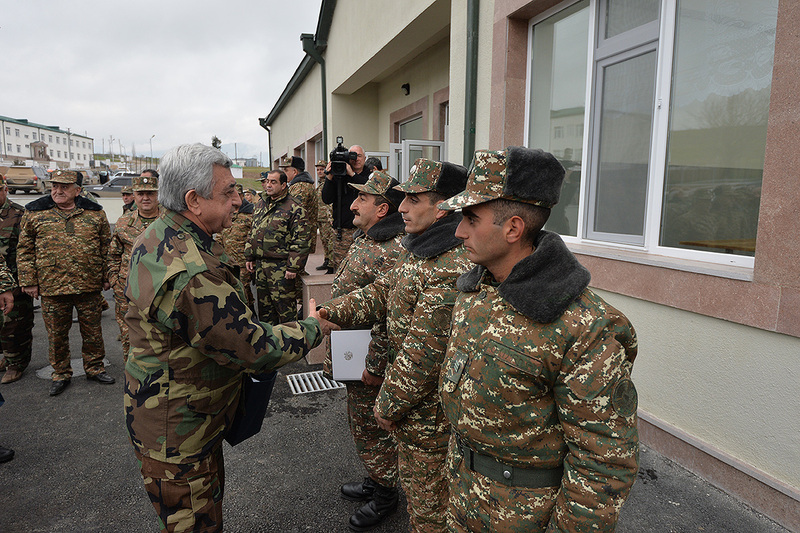 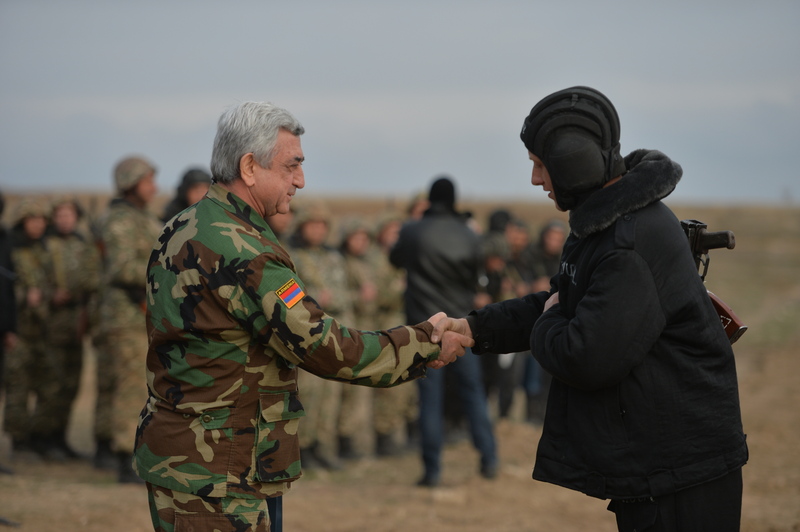 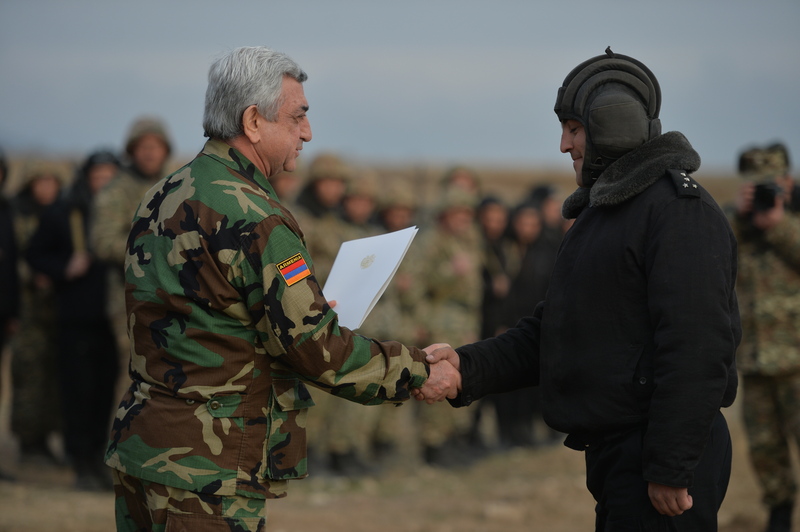 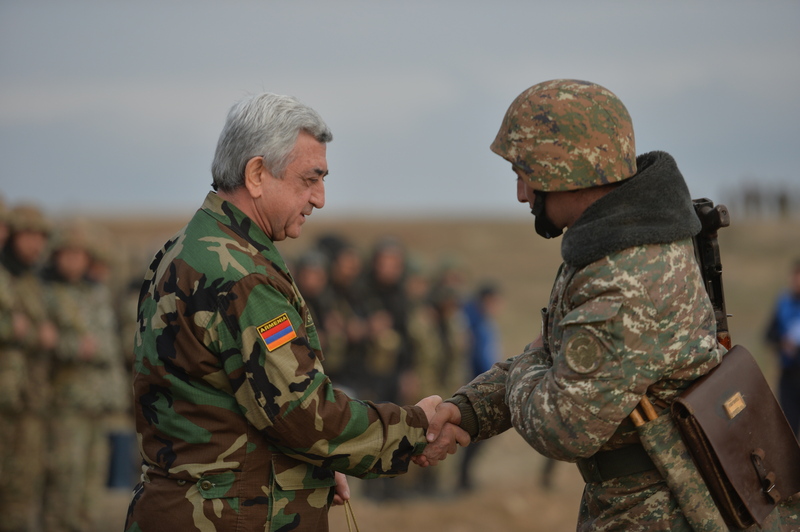 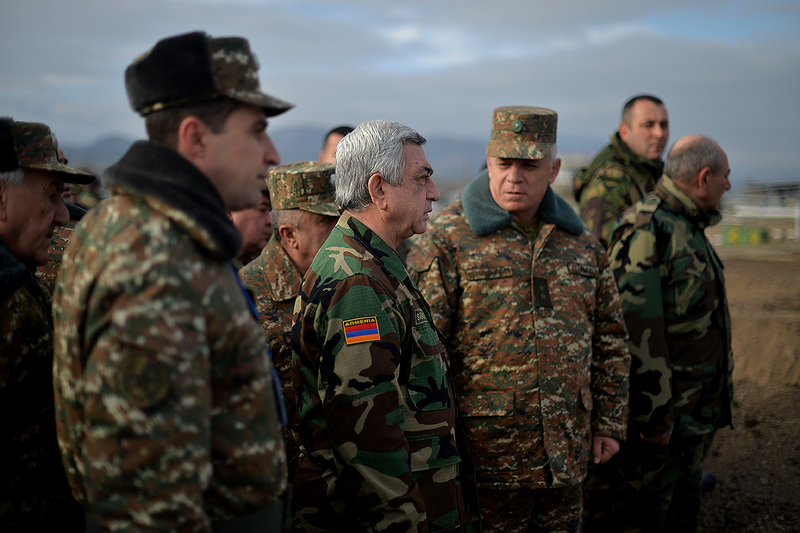 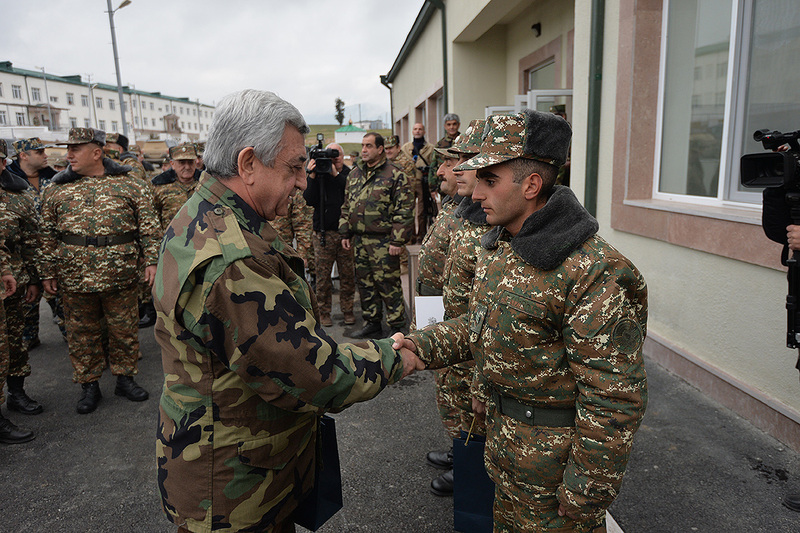 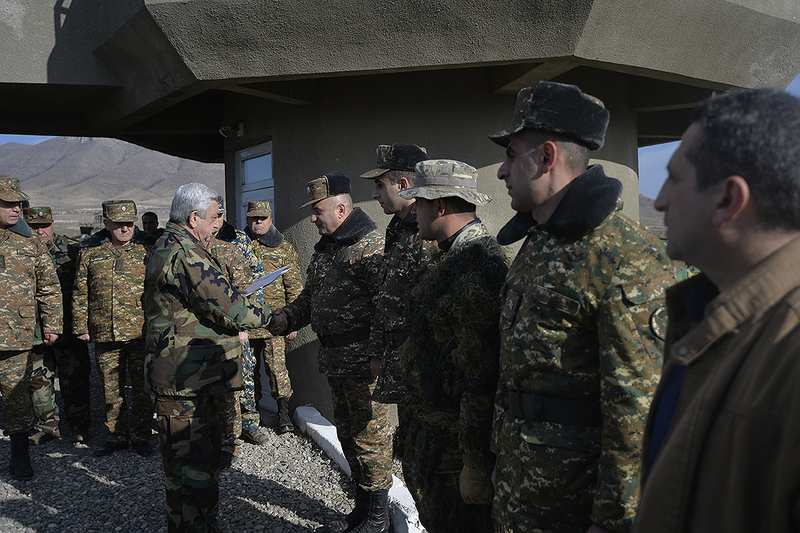 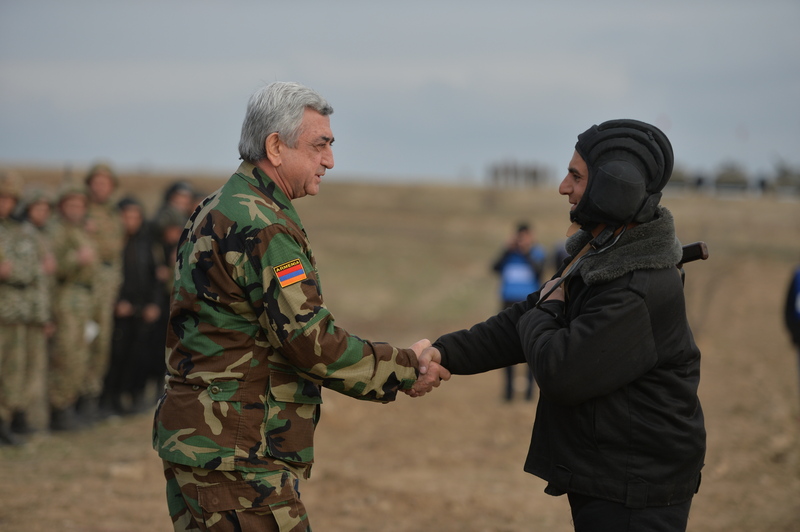 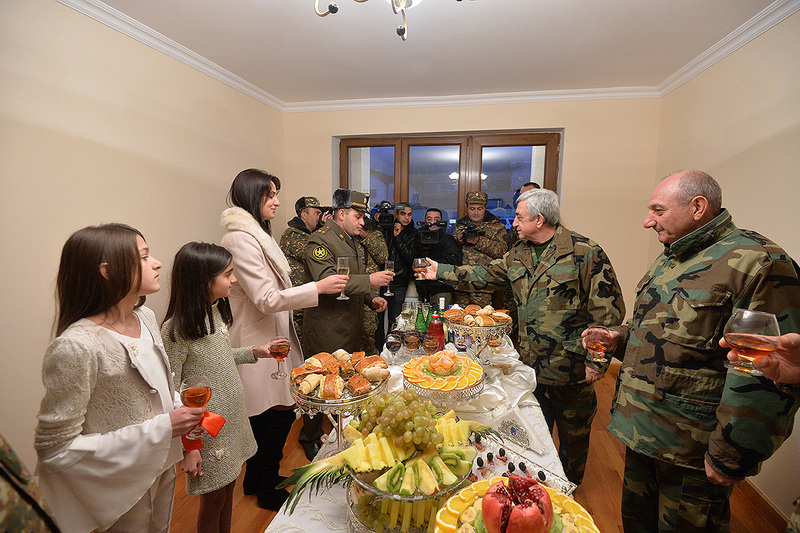 President Sargsyan encouraged the best officers, contract and conscript soldiers with gifts and incentives. 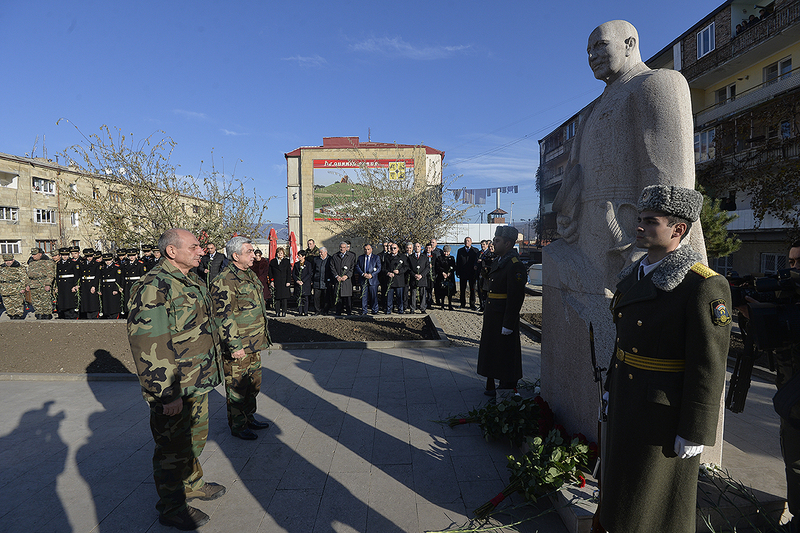 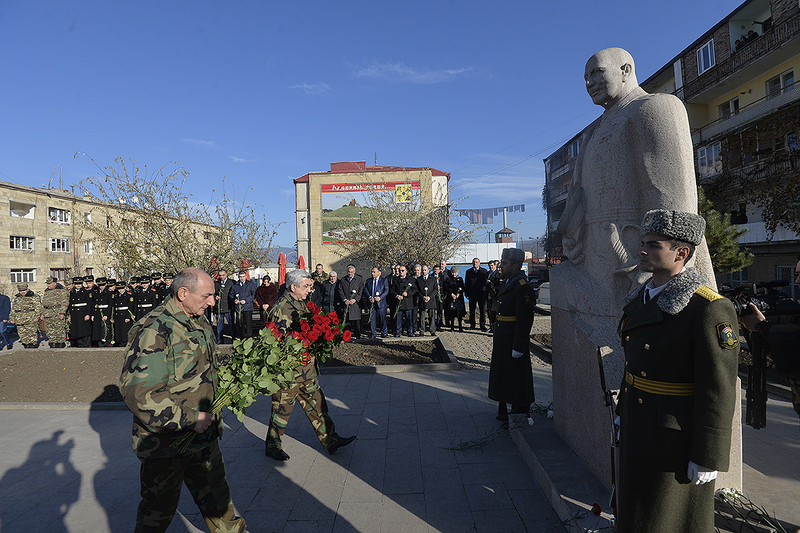 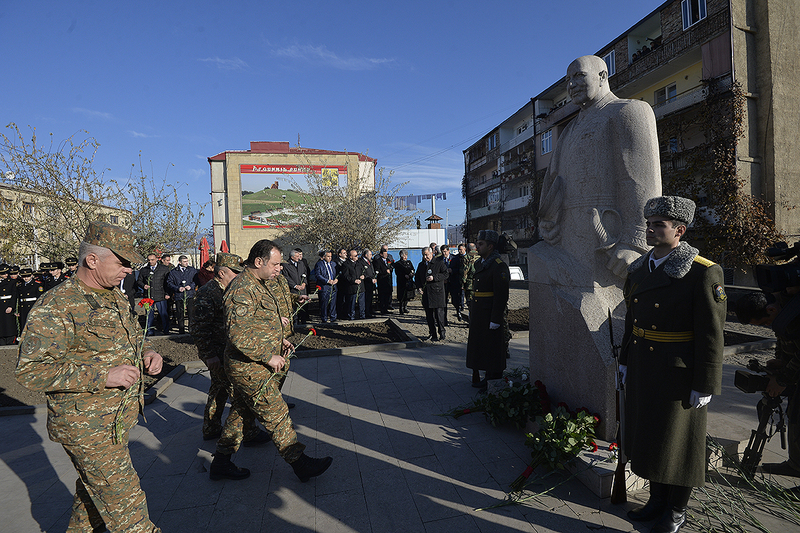 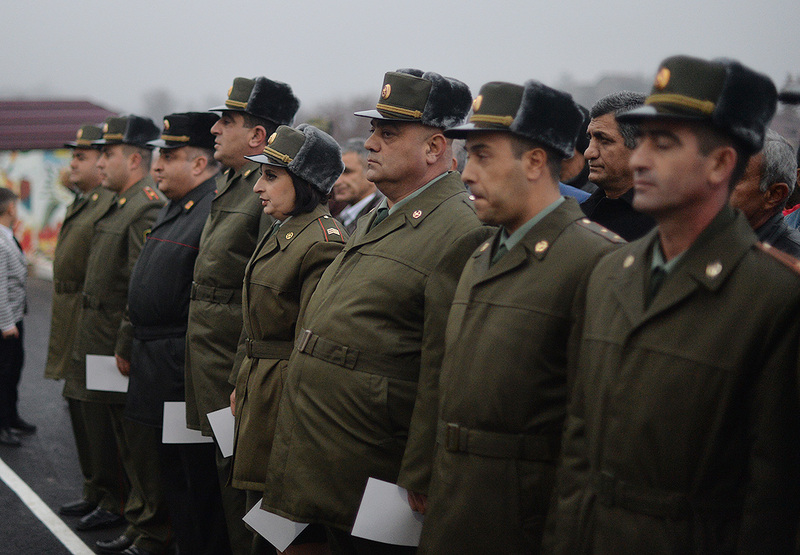 In Stepanakert, the Presidents of the two Armenian republics called at the monument to great Armenian Marshal Hovhannes Baghramyan to pay a floral tribute to the renowned Marshall on the occasion of his 120th birth anniversary.